We were awake by 8:00 a.m. and left the hotel two hours later for the flight to Brisbane. The second handle fell off the suitcase we had purchased in Yap. Will it make it to Brisbane intact? When we arrived in Brisbane we grabbed our rental car, stuffed it full of suitcases and headed to the closest shopping center. Here we purchased a cell phone and a cellular Wi-Fi card. We are back in the 21st. century! We will be able to talk to fellow citizens of the planet upon demand, just by pushing some little buttons. Similarly, we will no longer suffer from the “We only have internet in the lobby at twelve dollars per hour” syndrome. Somehow we managed to drive from one side of the city of Brisbane to the other to find our hotel and furthermore did this mostly on the left side of the road. Another early rise and we are headed to a nearby Motorhome Conversion company for a 9:00 a.m. appointment. This company purchases used Toyota Coaster buses from Japan and converts them to motor-homes. 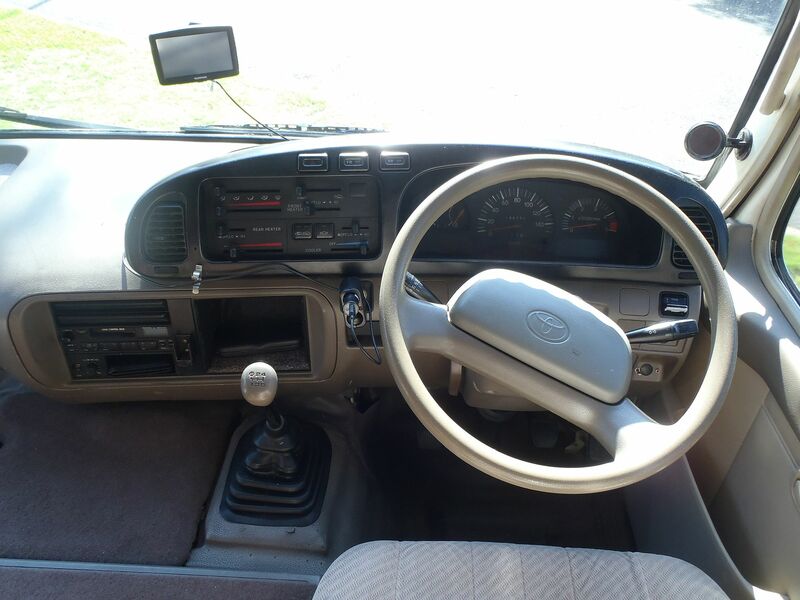 The “Coaster” is the most common brand of bus found in Australia and is based upon the Toyota Land Cruiser components. This means that it can readily be repaired throughout the country. We looked at four units at the Conversion company but did not find exactly what we wanted. Nevertheless, we got to see what the finished units look like with the various options available. Our next step was to find lunch materials and we were directed to a nearby grocery store “Coles”. The mall was directly behind the hotel and I drove confidently into the underground parking area, where I believed the grocery store to be. What a nightmare! Every parking stall was occupied and people waited in the narrow aisles – patiently I might add – for someone to leave so they could park. I drove from parking area to parking area and it was the same story. Finally I found a slot in the distant reaches of the mall, on the surface parking. Cursing the morons who provide a black rental car, now baking under the Australian sun, we marched into the mall. Where is Cole’s?, we queried. “It is difficult to explain”, the man said, “follow me”. He cast us loose after leading a tortuous winding trail and then pointed down the mall. Our search continued as we now followed signs indicating the direction to go. Eventually we did find the groceries and I abandoned Annette to her shopping while I attempted to retrieve the car and move it closer. This exercise took 35 minutes and I wondered if I would ever see my bride again. Finding our way through a maze of reefs in the Red Sea was child’s play compared to mall shopping. 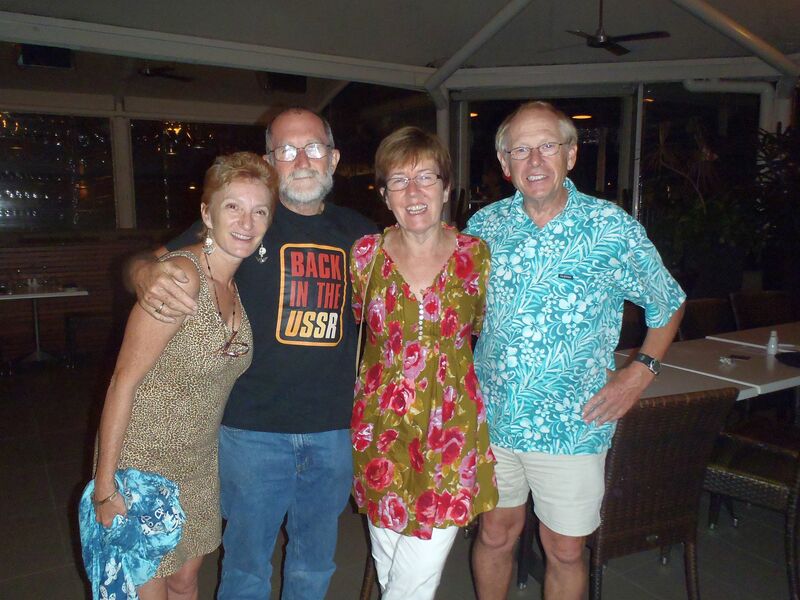 Our next adventure sent us south to Paradise Point where we were to meet Bea and Diane, last seen on Cocos Keeling Island in the Indian Ocean, in October of 2006. When we arrived at the boat ramp we saw Diane driving towards us in her dinghy and just as pretty as ever. 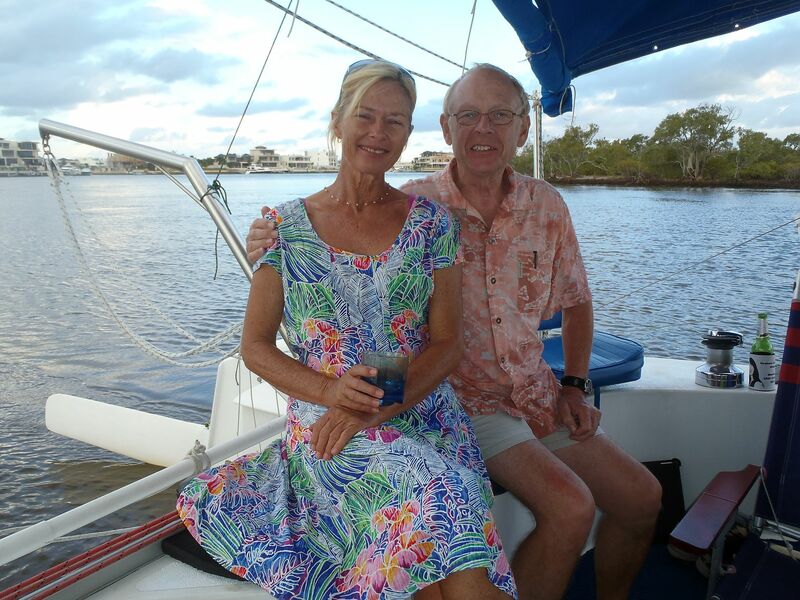 We were back on the water and soon boarded their catamaran “Sortilege” to join Bea, drink beer and wine and reminisce of distant places, coconut palms, deserted white sand beaches, bonfires under the stars and the like. Bea and Diane had weathered the hurricane that struck the coast last month and S/V Sortilege looked to be in fine shape to go to sea again. Diane had fixed supper for us and just when we were about to burst, she produced a traditional “Christmas Pudding” that she had been saving. What a treat! I am surprised that the dinghy didn’t sink as we reluctantly motored through the darkness of the estuary, dodging moorings and enjoying the night sky. Just like old times! Two more motor homes to see today and they are well spaced apart. We first shot north on a 190 mile run north to Hervey Bay. We arrived in early afternoon and although the unit had been well loved and was in good condition, it was over the weight limit of 4,500 Kgs. and not drivable without a commercial Australian license. The next unit lay another 165 miles to the west, along winding two lane rural highways. There was evidence of significant recent flooding at several of the river crossings and we were concerned as to the viability of our route. In addition, in several areas there were brush fires and we drove through dense and choking smoke with flames licking along the verges. If we hadn’t been following another vehicle, I doubt that we would have attempted a solo crossing of these obstacles. 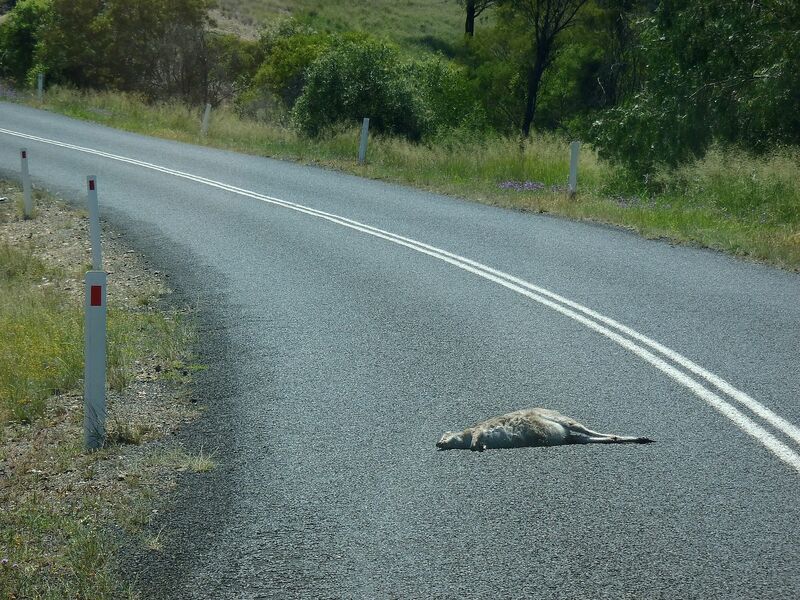 Throughout this high speed run across Australia, Annette logged the road kill and scanned the countryside for ‘Roos. We have been here several days and still haven’t seen a live specimen. 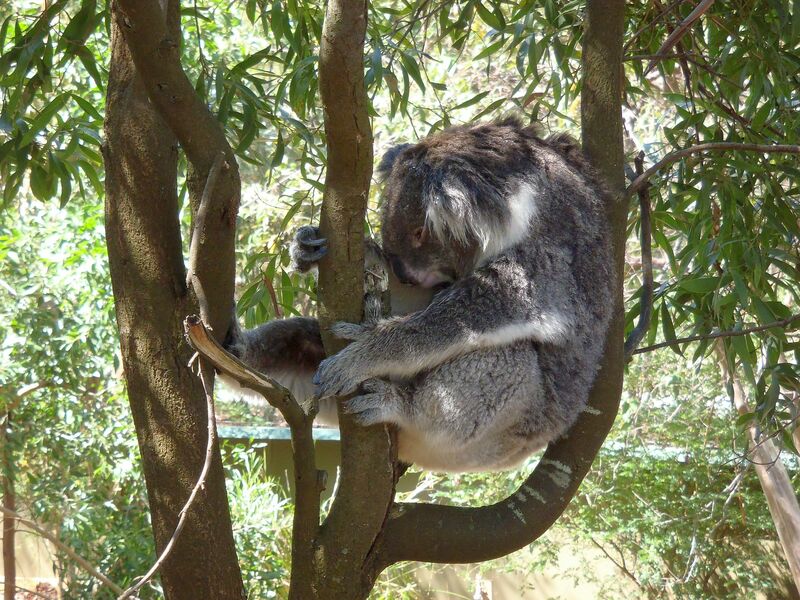 The roadway signs warn of Koala crossings but we see only one “possible”, well smashed as road-kill. The second motor-home lacked cabin-air conditioning and was a little “tired” for the asking price. This exercise is the “due diligence” we feel obligated to perform and by now we have seen six units. Dusk was approaching as we began the final 170 mile run back to our Brisbane hotel. We stopped to buy gas and it is well that we asked for directions - A local rancher warned us that our proposed route included an impassible section of road, washed out by the hurricane. Local knowledge is a great thing and we set out on a diversion but watching the verges very carefully for the kangaroos that become active and forage at dawn and dusk. 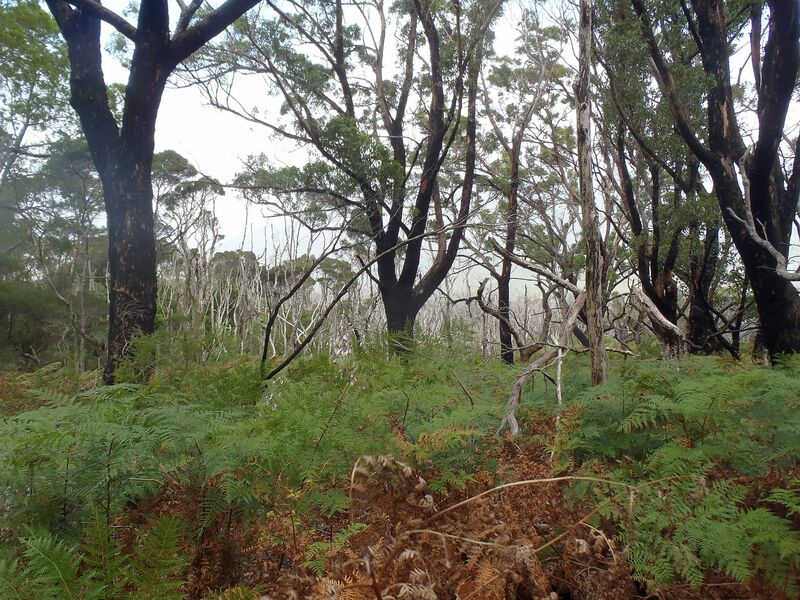 Annette had logged three large, mostly dead snakes, as well as a dead goanna, when I spotted a live kangaroo, sitting about 20 feet back from the road and watching us gravely as we rocketed by. We had already noticed several recent corpses by the roadside, clearly indicating the potential hazard. A full grown kangaroo can weigh up to 200 pounds and sits on its haunches over five feet tall. These will make a mess of a rental car during a 60 mph collision. Fortunately we approached the outskirts of Brisbane without incident and made it back to our hotel with all parties unscathed. A long day. We did it! This morning we made a deal to purchase a motor home, the seventh we have examined. It had been parked less than a mile from our hotel in a nearby RV park and is a two month old “conversion”, completed last December. The sellers have since had a change of plans due to a medical emergency. We will next begin the process of transferring and exchanging cash, vehicle title and the like and hope that within perhaps 72 hours, we can occupy what is to be our home for the next 6 months. I had been told that I could only drive for three months on my Texas driver’s license but the wonders of the internet proved this to be mis-information. No problem driving this unit, which has been “de-rated” from 5 tons gross vehicle weight as a passenger bus, to just under the car license limit of 4.5 tons as a motor-home. This evening, we were supposed to be having supper with Bruce, the brother-in-law of long time friend and Houston neighbor Robert Welsh. One hour before our supper date, we received a cancellation e-mail from Bruce saying that he had spent the week-end trapped without supplies or shelter on a mountainside. Hungry, exhausted and sunburned, he had been rescued by helicopter by being winched from a 2,000 foot tall cliff, thereby making him the star of the 6:00 p.m. TV news shows. What interesting people we meet! Now we absolutely must get together with Bruce to learn all of the gory details. Watch this space! Our day began early and just before 8:00 a.m., I was drug out of the hotel shower, wet and dripping, to answer a conference call with the Houston bank, to confirm our request for a wire transfer of funds to Australia. Even earlier, we had rescued the scanner from the bowels of a suitcase and scanned the various documents we have acquired, so that they might be e-mailed around the planet. I next called the Queensland motor-vehicle department and talked to a helpful lady who ran down the list of documents I need. There is the F3520 transfer application form, as well as the F3503 “New Customer Application” form, together with which, I also need to provide my passport and two credit cards as proof of identity. 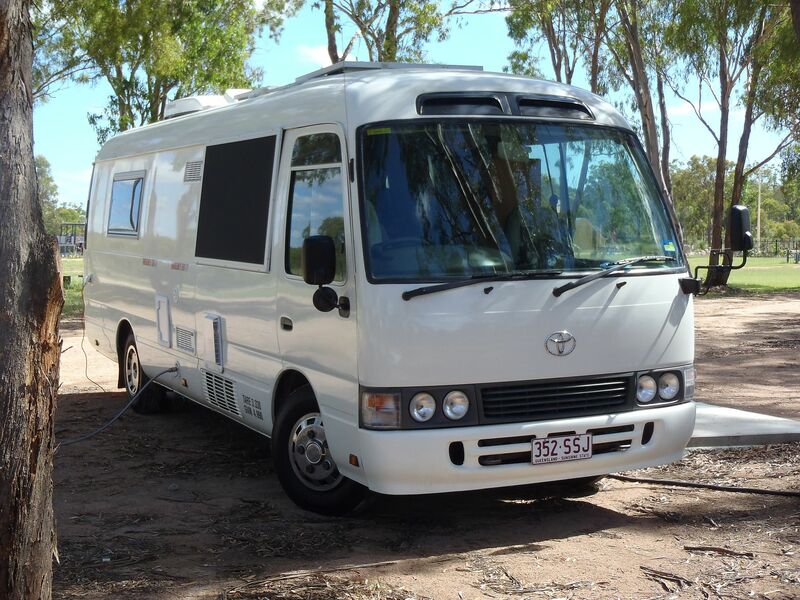 I downloaded from the internet an F4408 form which is an affidavit that the motor-home will always be “garaged” in Queensland - which it won’t. The bureaucrats are perfectly aware of this but forms must be filled out! Just like the USA, the eight Australian States and Territories each have their own set of rules. I had arranged to use my cousin’s address in Victoria but this is not acceptable to Queensland. Thus I sent an e-mail to Bruce, commiserating him on his week-end mishap and asking if we could use his address if we agree to pay our own speeding tickets. He kindly acquiesced and we are back on again for supper on Wednesday, when I have promised to feed him dinner and ply him with alcoholic beverages so that he will sign my form. Although the motor-home was registered six weeks ago with a valid vehicle safety inspection certificate and a certificate that states that the propane system has been inspected and approved, this has to be repeated since these certificates are “one shots”. I called Rob, the seller to give him a head’s up on this. The final item we needed was a bill of sale and a copy of a hand written note suffices. Not too bad, we have this. 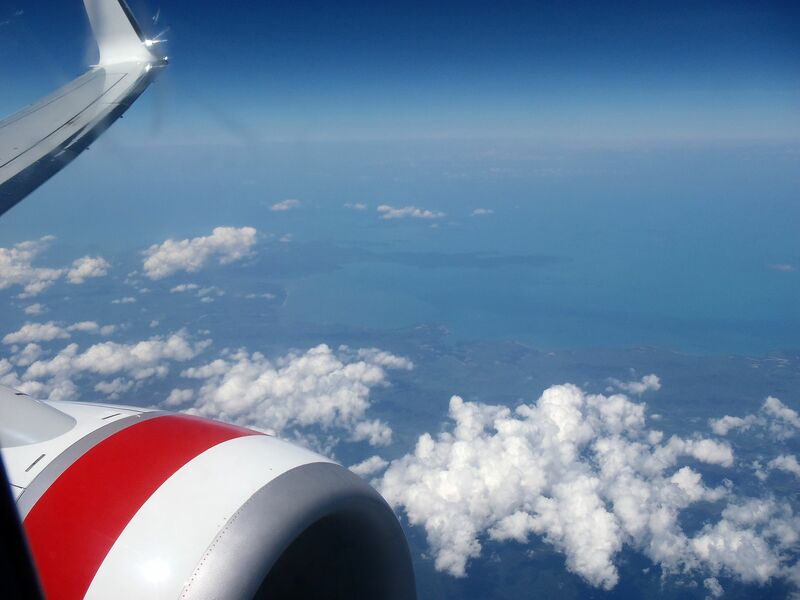 What I learned from fellow passenger on the flight from Cairns to Brisbane, is that in Australia, when you pay for “Rego” – vehicle registration, you are simultaneously purchasing liability (3rd. party) insurance coverage from the State. 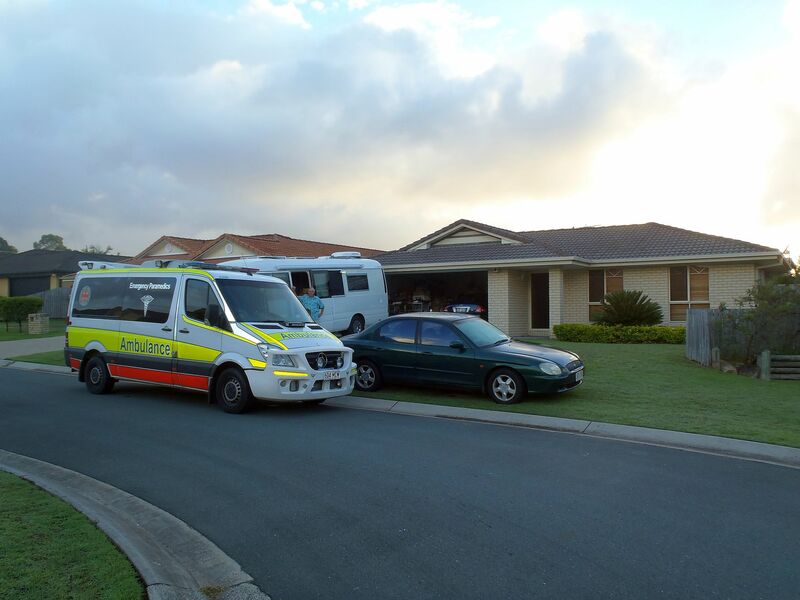 All legally licensed vehicles in Australia are therefore automatically insured. To get “comprehensive” insurance coverage (collision, fire and theft), I e-mailed off our details to a broker we had contacted earlier who specializes in dealing with members of the Caravan and Motor Club of Australia (CMCA) an organization we have already joined. The motor-home lacks a GPS navigation system and we repaired this defect by driving back to the “Mall from Hell” we had visited on Saturday to buy a “Tom Tom”. This visit was a lot smoother, as we now knew the ropes on parking, besides it was now Tuesday and the parking lot was only 95% full instead of 150% full. The “Tom Tom” GPS allowed us to easily find a nearby camping supply store and Annette has carefully measured the “Weber” brand barbeques. I had to prove to her that they could be purchased in Australia before she would accept not packing her USA version. Today we shopped. This involved driving all over the city but at least the Tom Tom prevented us from becoming totally lost. 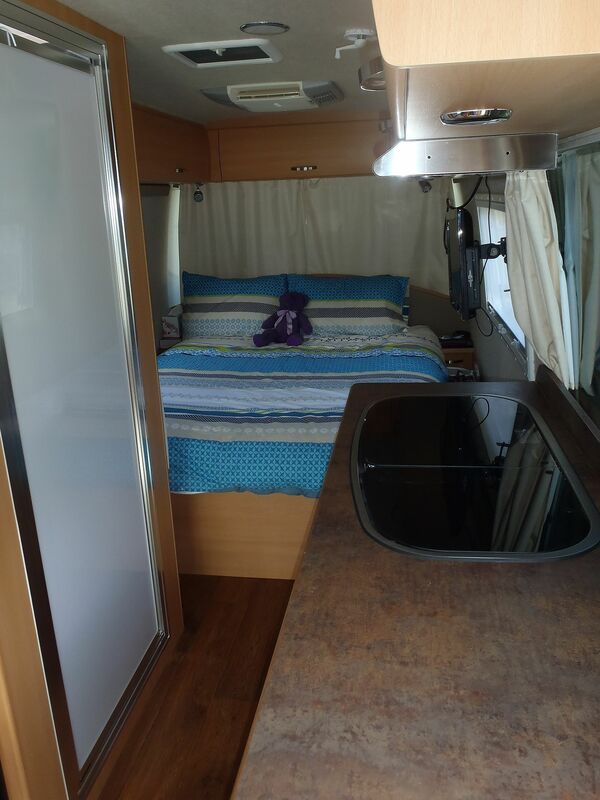 We now have sheets, pillows and comforters for the motorhome bed so at least we can sleep. By evening we had confirmed that the wired cash had left the United States and was hovering somewhere over the Pacific. Maybe tomorrow. This morning we found a voice message on our cell phone from Rob the RV seller, indicating that they had received the money transfer from the USA but that it was several thousand dollars short. Gosh Darn those banks! The Master Card people charged 1% for a currency conversion, the ATM charge was 2% and I had allowed 1% for a wire transfer between banks. However, the SOB’s at the bank had in fact charged 4%. The immediate problem was to correct the shortfall, so we made an early morning run to the ATM machine to withdraw the maximum cash (ATM cards have a daily limit so that a criminal can’t empty your bank account in a single fraudulent transaction). We did this early because it is still yesterday in America and we will be able to make another withdrawal today, after mid-night California time. We spent the balance of the day exchanging sheets, buying dishes and cutlery (we can eat!!) a power cord to connect the rig to city power and a water hose to add water service at a “caravan park”. In the evening, we again attacked the ATM and it cooperated by ejecting more cash. We now have in hand the needed cash shortfall and can close the deal tomorrow. Early rise to check out of the hotel and meet Rob to go to the Queensland Transportation Department to transfer the vehicle title or registration. The lady at the registration office scoffed at my various addresses and insisted that I needed to have some kind of alien registration form completed and sponsored by a third party resident of Queensland. Horror! I offered the completed and executed form – the “garaging” affidavit, that Bruce of the helicopter rescue had signed for me a couple of nights ago and she paused. Grudgingly she agreed that that “might” do. The “stamp” transfer fee is 3 1/2 percent of the sale price and I had already researched that this could be paid by credit card. It was done! At 0845 hours we owned the motor home. Next step was to unload suitcases and pack the contents away in places where we might find the items again. The “Yap” suitcase was deposited next to the dumpster – it had survived four flights but was now handle-less, a wheel had collapsed and it was near useless. While Annette continued to pack I took off to scout for a gas station with easy access for a motorhome, in order to buy diesel. I refueled the rental car for it's return and confirmed that in Queensland, you can only buy beer at a “bottle store”. I found a wonderful “drive through” liquor store, of the type that New Mexico recently banned, in the mistaken belief that drinkers couldn’t leave their vehicles to enter a liquor store through the front door. Annette was getting close to finishing up her projects, the fridge had been turned on and loaded with beer and we were near ready to depart. I had tested the engine earlier and had discovered that there was a gas pedal (accelerator pedal in Oz) interlock that I couldn’t release. I prodded, searched, tested but nothing seemed to work. I had also called Rob the seller but he was back at the hospital having more medical tests and didn’t answer. The internet also failed to come up with an answer but did provide the phone number of the conversion company. Fortunately when I called, the man I spoke to remembered this vehicle and advised me to slam the rear door “hard”. There are two sensors on the side and rear doors and if either shows the doors open, the vehicle cannot be driven (I will fix this!) I followed the instructions and sure enough everything now worked and at 1100 hours we pulled out in our motor home to begin the new phase of our adventure. We were bound north to visit friends Ray and Jodi. We had first met them in 2004 when they were on honey-moon on Easter Island and had visited them again in 2006 when we sailed to Australia. Jodi had been extremely pregnant at the time and is now the mother of 6 year old Dakota and 2 year old Jesse. Ray had magnanimously offered to let us park our rig in his driveway and offered us the loan of his car to make a trip to the hardware store. I am sure that there will be several more visits to hardware stores yet to come but the purpose of this trip, was to buy the components of an adapter to allow the 15 ampere power cord of the motor home, to plug into the standard 10 ampere household socket. The helpful man at the hardware store gravely intoned that this was illegal in Australia and that the ready made converters were available at caravan suppliers for about $70. I purchased the components for $13 and thirty minutes later we were hooked up to Ray and Jodi’s electricity and had the air conditioner working. That evening we visited a local fish and chip restaurant on Brisbane Bay where we had excellent “Barramundi and chips”. The girls went to bed leaving Ray and I in a deep philosophical, historical and political discussion fuelled by Galway port and Bundaberg rum. I am not sure what time Ray and I had headed for bed in the wee hours of this morning but at 0600 hours, a tearful Jodi woke us by knocking on the side of the rig. She was alerting us to the fact that Ray had been suffering from severe chest pains for the past several hours and she had called an ambulance. The paramedics hooked Ray up to an EKG machine, checked and prodded and then decided to transport him to hospital for further testing. Wow! I felt extremely sluggish due to the fact that I had but a couple of hours of sleep and guilty that last nights binge had caused or contributed to Ray’s condition. Ray was now being examined and tested at the hospital, so Annette got to babysit adorable grandchild substitutes, while Jodi drove me back south to rescue the abandoned rental car. Dakota has recently discovered that she is a girl, loves pink, everything with fairy wings and was fascinated with Annette’s earrings and the butterflies on her dress. 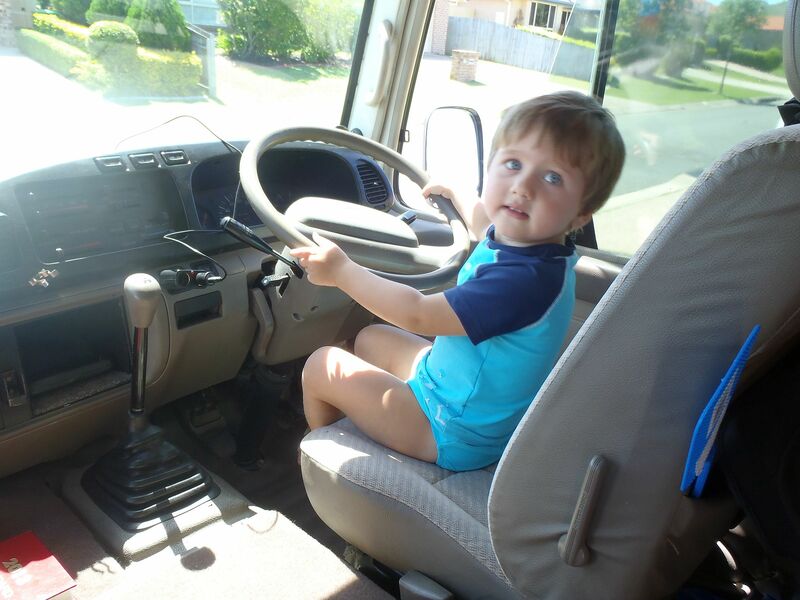 Two year old Jesse is into guy stuff – anything with wheels. Definitely a future NASCAR driver. By the time Jodi and I had returned from our errand, Ray had been scheduled for an afternoon treadmill test and vast numbers of friends and family had shown up to provide moral support. We took this opportunity to take an afternoon nap to attempt to repair the trauma of the early morning emergency and to familiarize ourselves with more of the RV systems. We have worked out how to use the toilet; mopped up the mess cause by the early experiments in flushing and now have this part down pat. We have yet to empty the tank of course but will review the manual before we attempt this procedure, since any mistakes have a higher consequence. I have now checked two thirds of the tire pressures and will keep working on this project. Jodi retrieved Ray from the hospital late that afternoon and he seems none the worse for wear. Ray does not yet know the exact cause of this morning’s drama but the hospital was confident enough of his treadmill tests to send him home. We were all very pleased to see him and hope and pray for no more excitement of this nature. 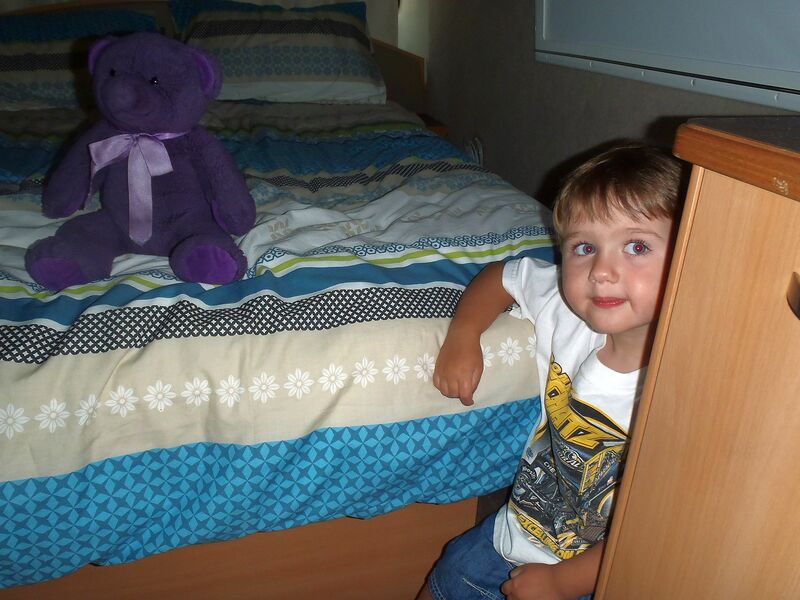 A second night sleeping in the RV and a no drama morning. I mentioned to Ray that I smelled smoke in his home but he didn’t rise to the bait. 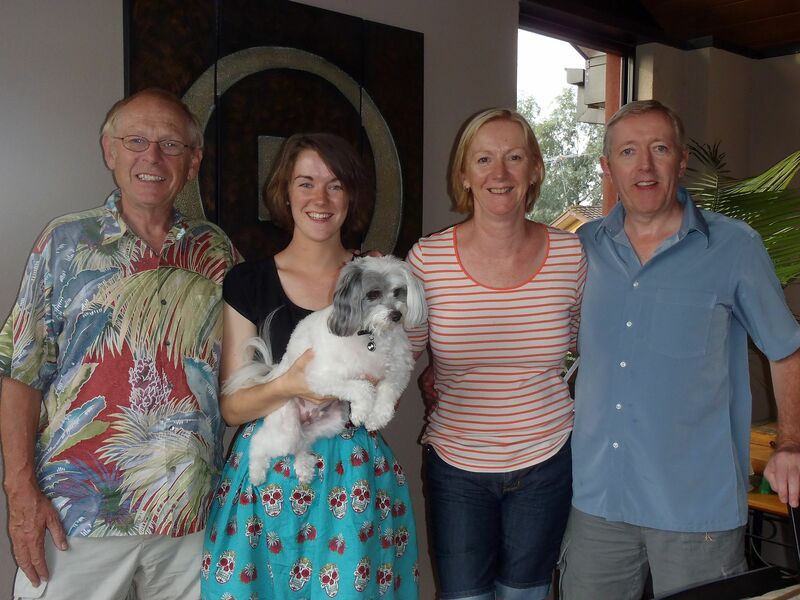 We reluctantly parted from Ray and Jodi in early afternoon, as they have been so hospitable and welcoming. We needed to “get off the dock” and continue our shakedown cruise, to complete the equipping of our new home and learn its systems. Our destination for the night was a caravan park called the “Lake Leslie Tourist Park” about 12 kms. 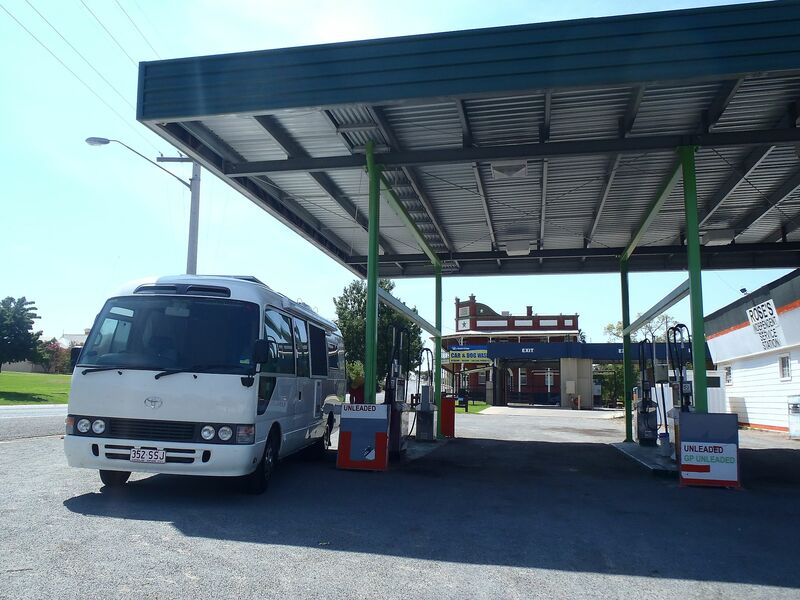 west of the small town of Warwick, Queensland and our route took us through the toll tunnel below the Brisbane river. About one third of the way through the tunnel, the oil warning light came on. Bugger! (an Australian expression of dismay) There is no place to stop, no pull offs and the like, so all I could think of was to slow down while chanting, “Don’t seize! Don’t seize!” As we emerged again in daylight, there was still no pull off and we simply stopped in the crash lane and turned the warning flashers on. Off came the engine cover and I checked the engine oil level twice. Clean oil – correct level. This meant we either had a mechanical loss of engine oil pressure due to wear or component failure, or a sensor failure. In the first instance, you have to rebuild the engine. If you ignore the problem and the engine seizes, then you have to rebuild the engine – same solution. If the sensor had failed there wasn’t any real problem, thus all scenarios said, “drive on and see what happens”. I restarted the engine. The oil warning light went off. Perhaps, this was a wear issue (the odometer only shows 187,000 kms = 116,000 miles). If so, the oil light would come back on as the engine heated and the oil thinned. Our three hour drive took us south west from Brisbane over the Queensland “Main Range” mountains and through Cunningham’s Gap, with an elevation of around 2,600 feet. The scenery is spectacular with soaring cliffs and rugged mountains all around. Of course I was oblivious to this as I was watching the oil pressure light like a hawk. It remained resolutely dark. The heavy clunking sound that we had acquired when we changed gears was repaired by Annette when she moved a large bottle of olive oil from a near empty locker and padded with paper towel rolls. The balance of the drive was without incident and we pulled into our campsite at around 5:30 p.m. to hook up our new power cord and water hose to the rig and break out the beer. Last night at the campground, Annette had finally found some live kangaroos	grazing, which means that she is officially in Australia! 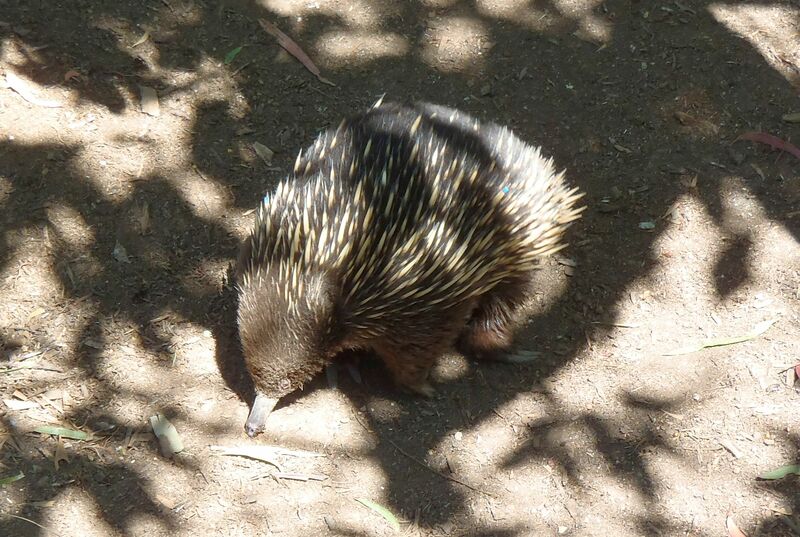 She repeated the exercise this morning and added more kangaroos and a Kookaburra to her list of sightings. 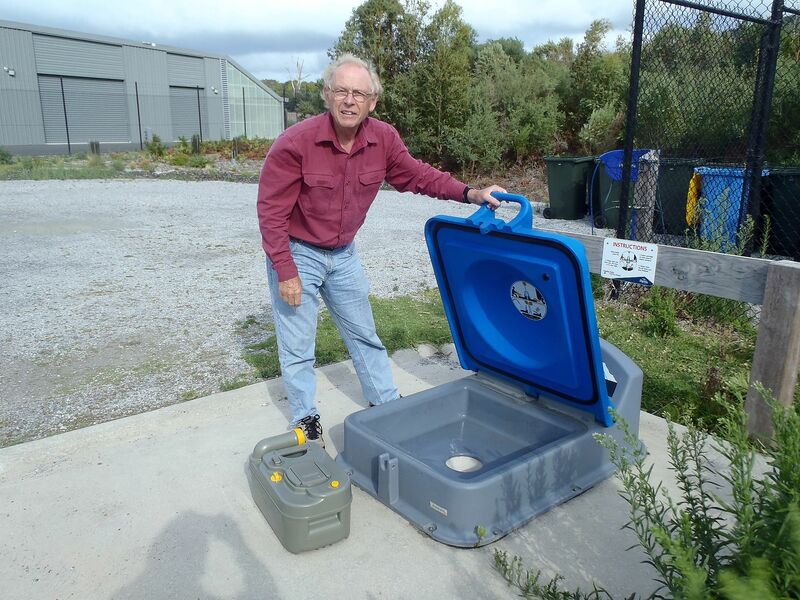 My big achievement was to empty the cassette toilet without involving the Australian EPA – if they even have one! 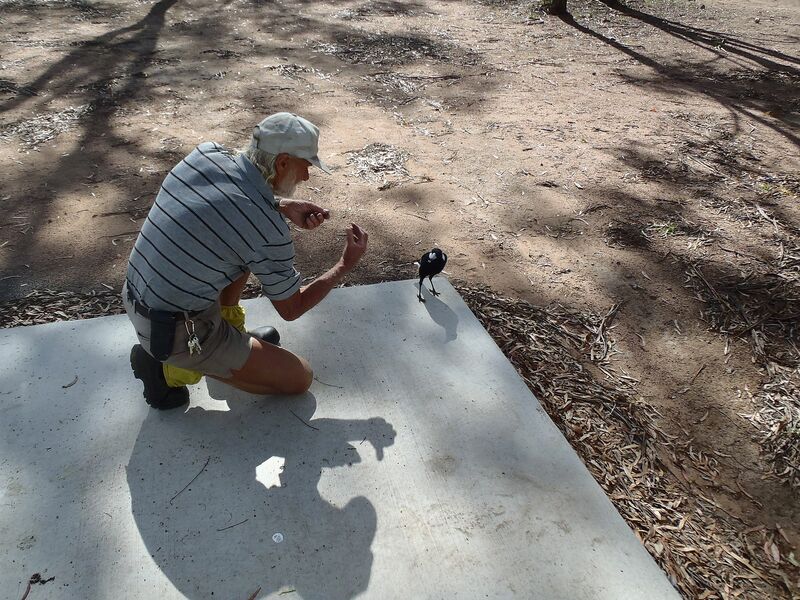 Motorhoming in Australia differs in this respect from the USA version, in that the camp-sites do not have sewer hook-ups to take the discharge from the toilet – so called “black water”. Some parks will have a drain pipe in the ground but this is for “grey water”, the waste from showers, kitchen sink and the like. Most do not have this facility and the preferred approach is to run a discharge hose to a thirsty looking tree and spread the wealth a little. 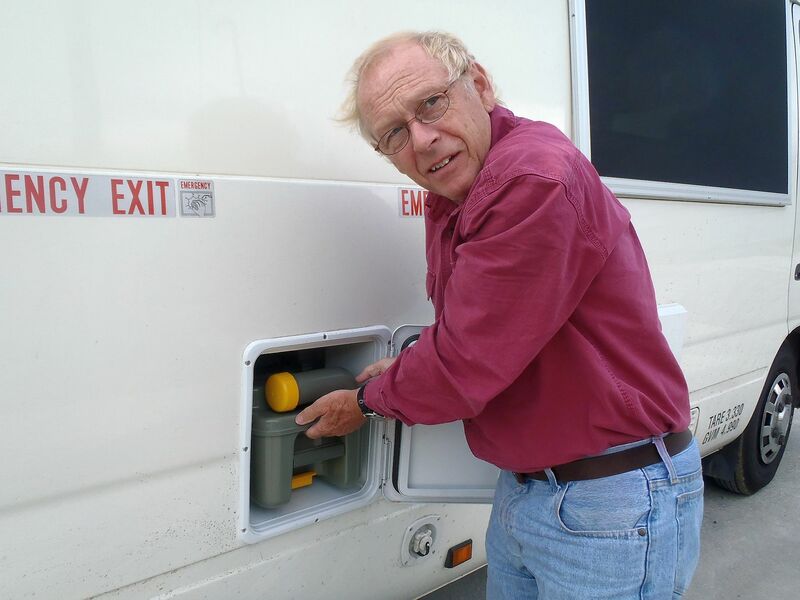 Because there is no “black water” connection, the toilet in the motor home has a removable tank in the base – a “cassette”, and this is removed from the outside of the vehicle by sliding it from a compartment. The next exciting step is carry it to a dump site and pour the contents into a sewer pipe, before flushing the tank with a water hose and adding chemical deodorant. The tank is designed not to spill and I am glad to say that in this instance it cooperated. 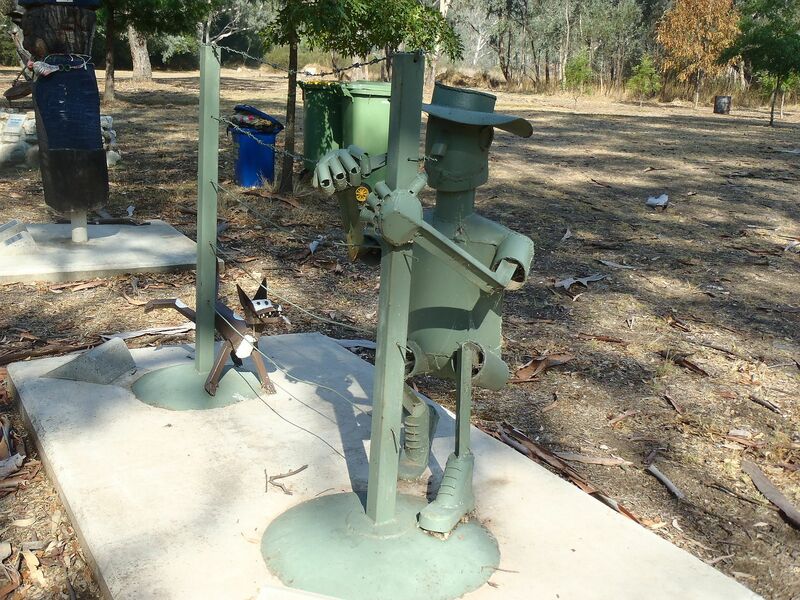 My task was supervised by Frank, the caretaker of the park, who looked as authentic an Australian as I have ever seen, with boots, gaiters, shorts and hat. 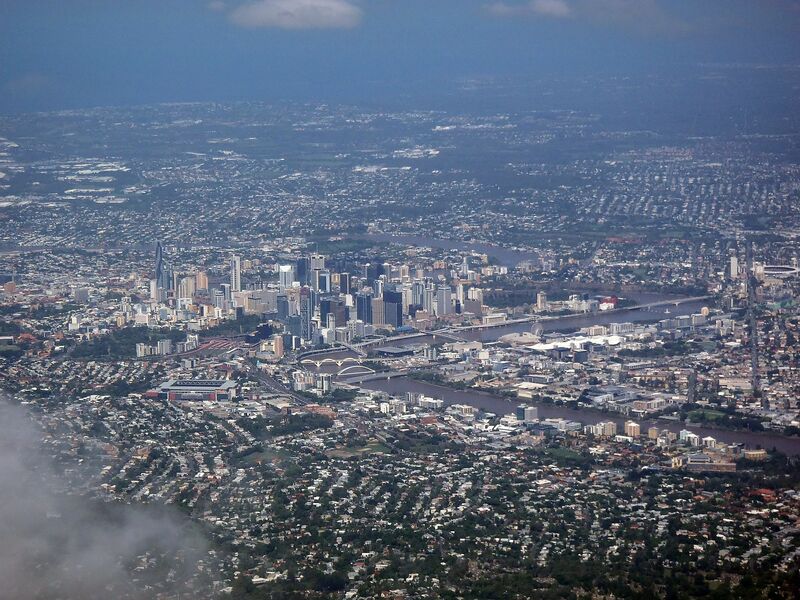 Frank provided the intelligence that, “Queensland is where Australia begins and ends - everybody else is just there to fill in the blank spaces”. He was one of nine children and his father kept control with a bull-whip. Now why didn't we think of that? We had a late start and headed south towards the town of Moree, stopping for a picnic lunch at a roadside park in Goondiwindi. I glanced across at the Coaster and noticed that the brake lights were on. The ignition was off with the key out but whatever I tested or tried, the brake lights remained on. Annoying to other drivers maybe but not a critical problem yet. The town of Goondiwindi boasts a “Tobacco Museum” and as this was just on the other side of the highway, we walked across to check it out. Sitting inside the museum entrance was an elderly gentleman who asked us to sign a visitors log and we did. Annette wandered off amongst the exhibits but he had fixed me with a beady eye and asked sternly, “How much would you pay to visit a Museum in Texas?” I was slightly flummoxed by this odd question but noted that in Corpus Christi, we had the “Lexington”, the World War II vintage aircraft carrier that had been turned into a museum but that I believed it to be the only real museum in town. He interrupted and said, “Where are you from again?” I reiterated, “Corpus Christi, Texas”. Oh! you’re from overseas! I thought you were from Texas, Queensland! 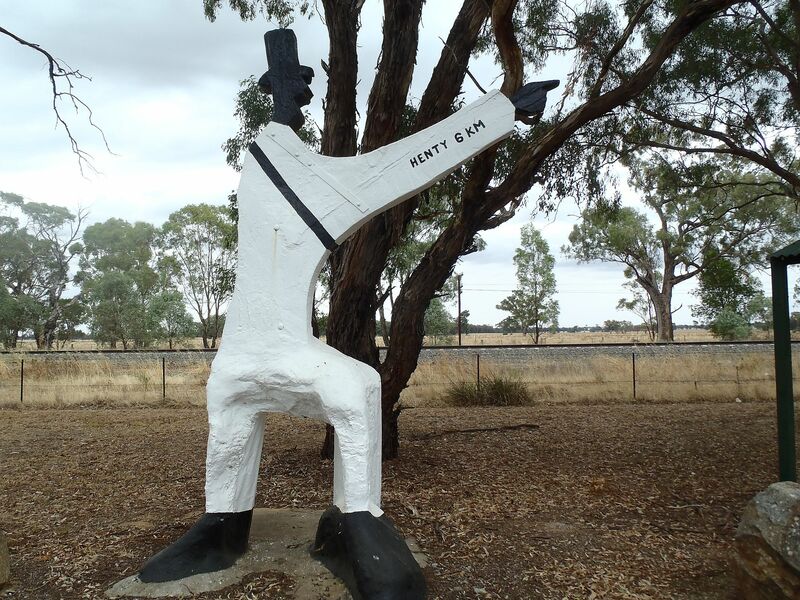 (Texas, Queensland is a town with a population around 700 souls and lies 70 miles east of Goondiwindi. Texas, USA is bigger and further. 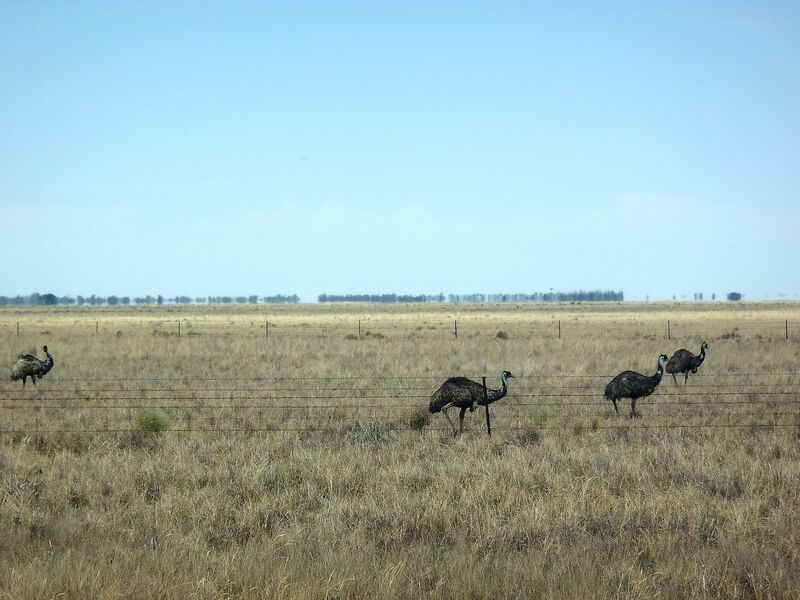 Now that we knew everything about tobacco, we continued our journey south, passing two emus in pasture. 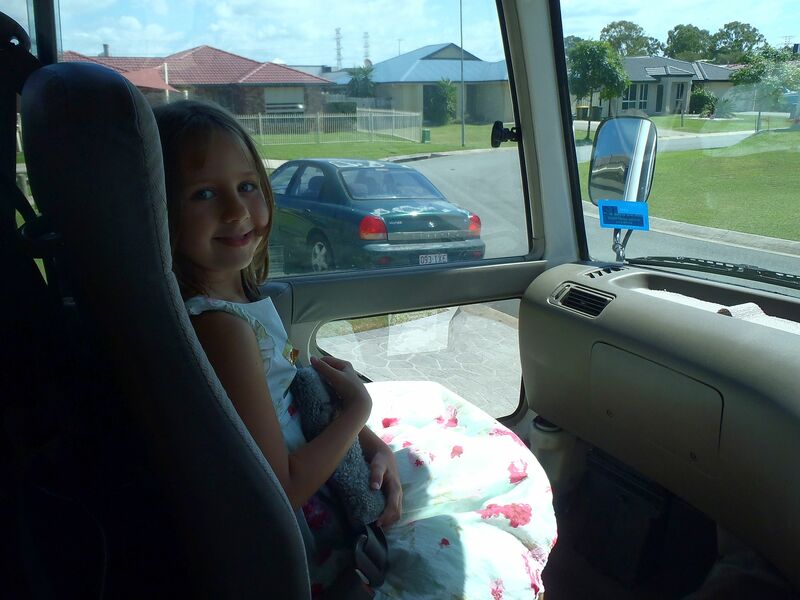 At Mehi, New South Wales, we pulled into the Mehi River Van Park for the night, with dark clouds on the horizon warning of an approaching storm front. My first task was to turn off the brake lights before they exhausted the starting battery. I searched for the fuse box but it was well hidden and the search failed to discover either box or operator’s manual for the Coaster. OK, I will disconnect the battery. Again a quick search failed to locate this. Grumbling, I was reduced to sliding underneath the vehicle and following the cable from the starter motor. The batteries were directly beneath the kitchen unit, containing the sink and stove top and removing the drawers from the cabinet did not expose them. Surely I didn’t have to remove the whole unit! I used the internet to find the contact number of the company who had customized the vehicle and called. The man I spoke to walked us through removing some wooden blocks, that held in place an access panel. He was no help on the Coaster fuse panel though. 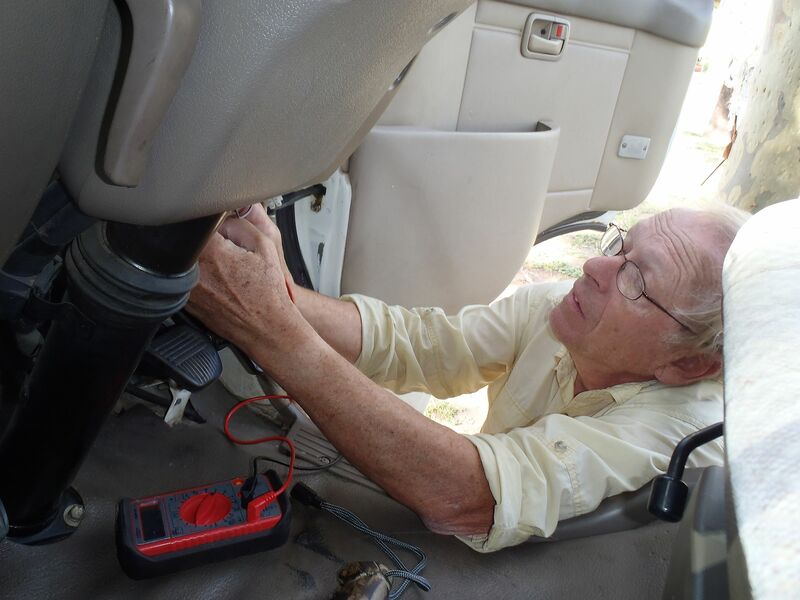 By now I had realized that the vehicle has a 24 volt system so I disconnected the cable connecting the two starting batteries and the brake lights finally went off. This was timely, as the storm front had arrived and rain and buffeting winds scoured the campsite. The next step was to find and download a wiring diagram from the internet and this was successful. I located the fuse box, removed the fuse and reconnected batteries. We could now drive the vehicle but without brake lights. I tracked the problem to the switch beneath the brake pedal, tested this and found it inoperative. This will be a task for tomorrow morning as there is a Toyota dealer about a mile from the caravan park. First job of the day was to remove the brake pedal switch and I first disconnected the wiring harness and re-tested it. Inoperative. I unbolted the switch and tested it again. It was working! Annoying! I toggled the plunger, shook it and swore at it. It worked fine. Re-installed the switch, reconnected the harness, replaced the fuse. Everything is working as it should and with no trip to the dealership for a replacement. In the process, I now know where the starting battery is, where the fuse box is and that the vehicle has a 24 volt system. I also suspect that as we have a second sensor on the vehicle having problems within 72 hours, perhaps the unit was parked for some period of time before being converted to a motor-home. In the salt-air environment on the Brisbane coast, there may be some small corrosion issues with the electrical connections. Another latish start and we headed south towards Dubbo, a town we had last visited in 2006. We had by now remembered that in Australia a “hotel” is not where you spend the night - that establishment is called a “motel”. Hotel’s are where you gamble on “pokies” (slot-machines), imbibe alcoholic beverages and eat. The hotel restaurants are usually the best deal for a “sit-down” meal, that is if McDonalds and Hungry Jack (aka Burger King) are excluded. 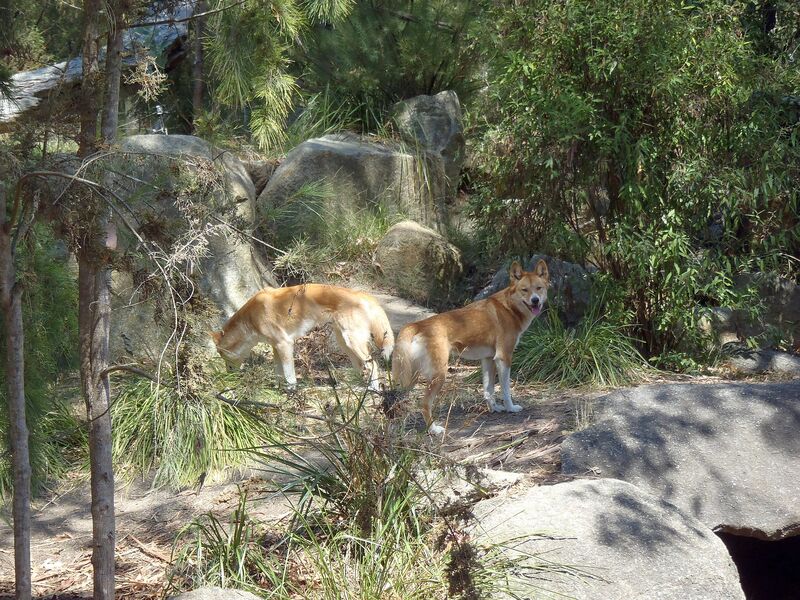 We were reminded again of the Australian disdain for “doggie bags”. They were less argumentative than 7 years ago and provided napkins to wrap our left over steak for its trip back to the RV. In our previous visit, we had been told that the practice was “unsafe”. When I asked if there was something was wrong with their food, they demurred but claimed that they could not know what our food storage facilities were like and did not wish to assume the liability. And the take-way from McDonalds? Annette maintains that within the decade, Australian restaurants will be providing containers as “doggie bags”. Last night I had asked at what time we were expected to depart the caravan park and the manager said, “usually ten–ish”. This corresponds with the motels we have stayed at. We rolled out of the park around the stated time and headed for a large auto-parts store. Here we purchased window shades and floor mats and we were able to park in front of the store and try the items to make sure of the fit. I also purchased a 12 volt air compressor, plus the necessary electrical connectors, air-hose and inflator fittings, to enable us to inflate our “dual wheel” rear tires, as well as the conventional front tires. Across the street was a large camping supply store and after careful measurement, discovered that we could store Annette’s desired “Baby Q” Weber barbeque, provided we removed the lid before loading into the Coaster’s rear storage. She was delighted and with the vehicle full to bursting, we headed further south to the town of Forbes in New South Wales. I assembled and tested the BBQ and then pulled out the greasy, rusty and bent bundle of iron bars, that I had found stuffed in the rear storage, wrapped in a rag. There is no doubt that this vehicle has never been serviced outside of a dealership. When the time came to sell it, they must have searched for the oldest, bentest old junk they had and tossed them in the stern. I found a rod and handle that when combined, enabled me to lower the spare tire that is hidden below the vehicle. The tire was filthy, forty pounds below useable pressure but was the same size as the other tires and in reasonable condition. I cleaned the worst of the muck off and inflated it to the appropriate pressure using my new compressor. I found a lug wrench that was the correct size for the wheel nuts and ascertained that the bent jack handle fit this. I didn’t bother to actually try it out, because mechanics like to use an impact wrench to tighten the wheel nuts to about forty million foot pounds each. In addition, I don’t know in which direction the Coaster’s wheel nuts are tightened. Commercial vehicles often tighten the nuts in different directions, depending upon port or starboard side of the vehicle - in order that they are “self-tightening”. More research needed. Meanwhile, Annette reorganized, re-packed and magically has been finding places to store all our “stuff”. A useful day. 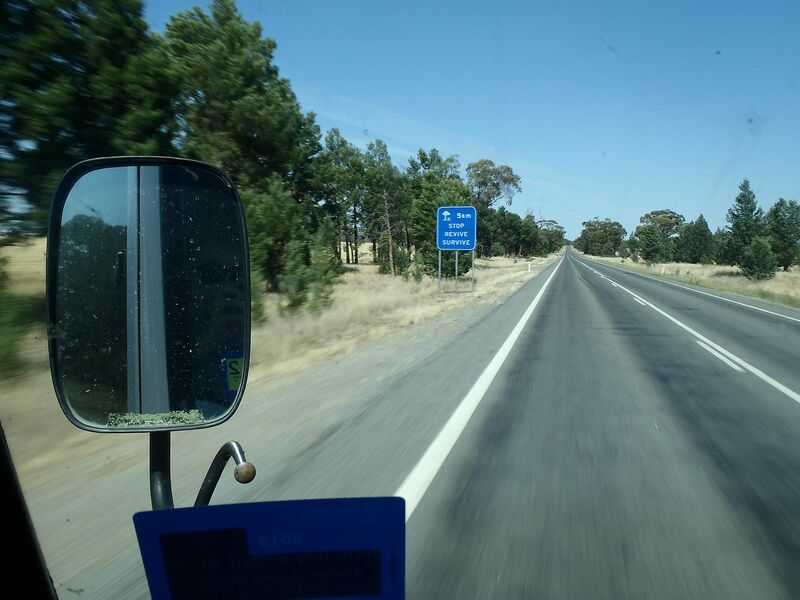 We continued south towards Melbourne on two lane highways that were often devoid of other traffic. The few vehicles we encountered were usually large trucks or “road trains”, with the tug vehicle pulling two large trailers. The approaching truck drivers would lift a finger from the steering as they approached us, in the traditional “guy wave” greeting. There were a few cars but “Utes” (utility vehicles i.e. pick-up trucks) were in the majority. 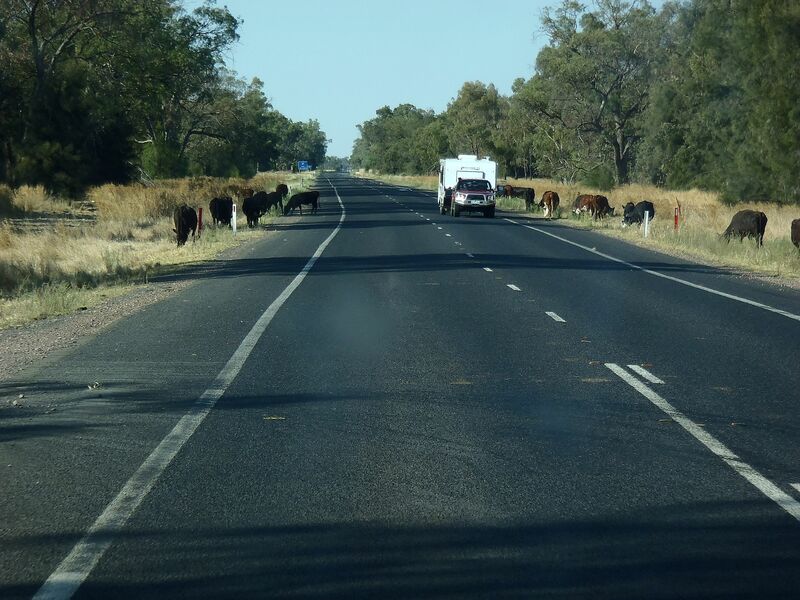 The terrain of the “Newell Highway” we were rolling along is made up of hay fields, interspersed with orchards of pomegranates and nectarines! Of course we knew this, not from botanical expertise but because that is what the signage indicated they were selling. Just as Annette was grumbling about the lack of fauna, we spotted a flock of Emus in a rough pasture and stopped for a photograph. We arrived in Jerilderie, NSW and decided to pull in for the night. This enabled us to trim our new rubber floor mats to the correct size and to try out the new BBQ. Pork chops with a balsamic and black pepper marinade, grilled onions, mixed green salad with strawberries and lime zest. No doggie bags required! Our destination today is Melbourne, a city of over four million inhabitants and home to four of my first cousins. We had misplaced some phone numbers and called another cousin, Marie, in Toronto, Canada to obtain these. When the phone was answered, we were shocked to hear that Marie’s health had taken a nosedive; she was in a coma and expected to pass within a day or so. We knew that Marie had been struggling with cancer but had spoken to her in early December and she sounded as cheery as ever. Such sad news. As it turned out, two of her sisters from Melbourne were at her bedside. In Melbourne it was a warm and sunny day and we skirted the city center, thereby avoiding the worst of the traffic as we headed towards the southeast suburb of Berwick. This is a pretty area with a flavor of an English village superimposed upon modern urban development. We parked our motorhome in my cousin David’s driveway completing a 2,000 km. shakedown drive from Brisbane. The Toyota Coaster has preformed well, despite the couple of early scares and has averaged about 15.1 liters of fuel per 100 kilometers - equals 15.6 mpg (US gallon). With diesel fuel at around AU$1.50 per liter - approx. US$5.90 / gallon, the operating cost of the motorhome is very similar to the cost of driving a large “class A, diesel-pusher” motorhome in the USA, that might average less than 10 mpg while burning diesel at US$4 per gallon. We have stayed at caravan parks every night during the drive south and have paid from $25 to $28 per night fees for a site with power supply. It has been warm during the days and the air-conditioner in the coaster has been very welcome. In the evenings, the temperatures have dropped markedly after sunset. An e-mail this morning gave us the news that Marie had indeed passed and our thoughts and prayers go to her and her immediate family. We will remember her as a special lady. A bundle of energy, wisdom, kindness and courage. We will miss her. Yesterday we spent the day relaxing and doing a little shopping, plus taking a drive in the beautiful countryside east of Berwick. We continued our tour of this beautiful area with a visit today to the Healesville Sanctuary, a wildlife center northeast of Melbourne. The center focuses on Australian wildlife and had some excellent exhibits. We particularly liked the flight arena show and our favorite demonstration was watching a Kite, skillfully take on the wing, food morsels that were thrown vertically by the animal handler. During the first show there was a programmed segment where we were solemnly instructed to recycle toilet paper. At first I thought this was a joke, because my family always enjoined each other to economize on its usage and “use both sides”. I then realized that this was a serious presentation. That evening I made an internet search and discovered that the world - excluding the United States - is concerned that their toilet paper should be made from recycled paper. The USA paper manufacturers grow large tree farms to supply their raw materials and see no net depletion of resources. Other internet articles warned that we should avoid recycled paper as a health hazard, since it often contains significant components of “thermal” paper from commercial sources. Such paper is commonly recycled but contains high concentrations of hormone inhibitors that are not removed by the recycling process. Got it now? We have been enjoying David and Kathie’s beautiful home and they have been such gracious hosts but the time has come for us to continue our walkabout. This morning our hosts headed for work and we headed southeast to Phillips Island. This is the home of a large colony of “Little Penguins”, the smallest specie of penguin at around 12 to 13 inches tall. The birds spend all day at sea feeding and at dusk, they come ashore in large numbers to seek their burrows and feed their chicks. At the park visitor’s center, we were told they had two spaces left on that night’s ranger guided tour and were selling these spots at a discount. We eagerly signed up and spent an amazing hour, seated quietly on the beach, at the entrance to a dry creek bed. The eight members of our tour plus guide, had been issued infrared night scopes and we watched the birds make their way through the surf, waddling uncomfortably across the beach and passing within feet of us. The birds are molting and when this process begins, they are no longer waterproof and must complete the molt over the next several weeks, before heading back to the water. They therefore gorge themselves with food in order to sustain their fast and on land they are ungainly walkers, even when they don’t have a weight problem. 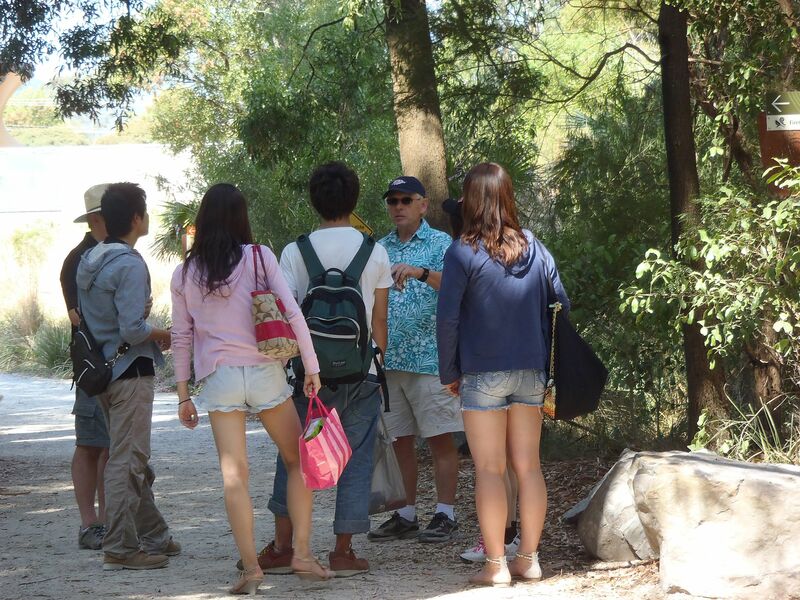 The tour lasted nearly three hours and during the hike to and from the beach, we watched the nocturnal activities of wallabies grazing, lots of Cape Barren geese, rabbits, a ring-tailed possum, and multiple rats. It was a warm and calm night with the southern sky bright and clear. Jupiter lay close to a half-moon, the Southern Cross, Orion’s Belt, Aldebaran, Sirius, Betelgeuse shone brightly. The shooting star we saw was either a chance meteorite, or US weapons testing as the Russians have claimed. Today was cold! Well for us anyway. We have enjoyed blue skies and heat for weeks now and yesterday evening’s penguin watching tour was in shorts and tee-shirts (us - not the penguins). This morning we dug through lockers looking for the long sleeved clothing and sweaters. Overnight the temperature had plunged thirty degrees (F). We wandered the town of Cowes, Phillip Island doing a little shopping and then headed off the island to spend the night at a caravan park at Lang Lang on the eastern shore of Western Port Bay, Victoria. We parked our rig facing the water, just feet from the waters edge but the tide was out and our view was of mud flats. 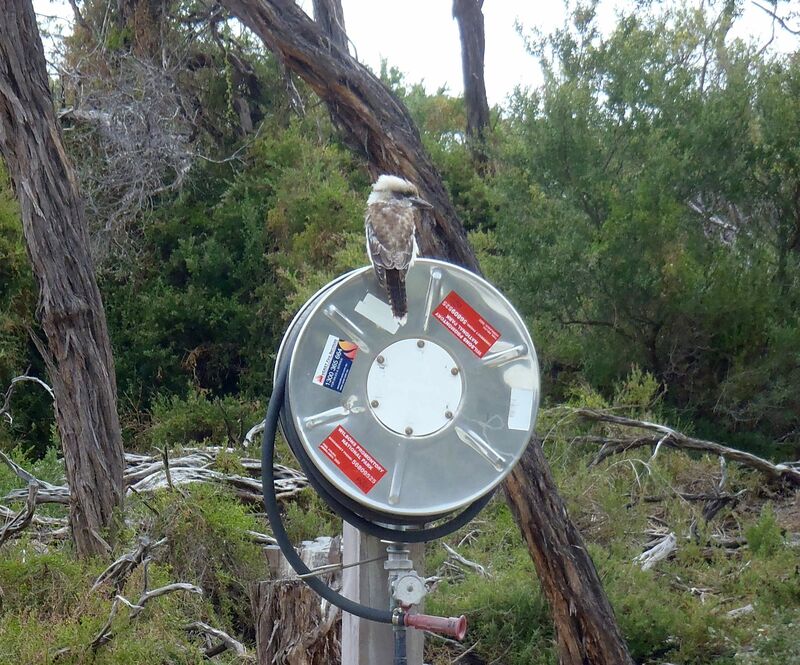 The caravan park owner had warned us that the water supply was "bore water" and unfit to drink. For drinking water, there was a large tank of collected rainwater but since our motor-home does not have separate tanks, we decided to simply use the balance of the stored water we carried. Unfortunately, there is no way of knowing the volume of water remaining in this tank, or if there is, we haven't found it yet. That night the mosquitos found us. I complained to Annette and she was sympathetic and adopted the "green" approach of swatting but after they began biting her, she flooded the rig with enough insecticide such that we groped through a fog for the next hour. No more mosquitos though. This morning, we pulled out the manual on the A/C unit to work out how to turn heating on and huddled in bed until the interior of the bus warmed up. Outside it was rainy and blowing. 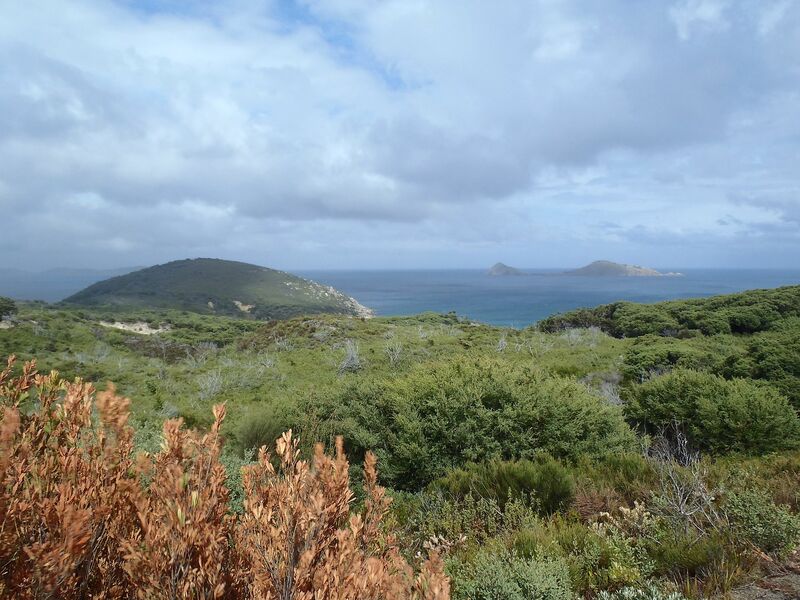 Our destination for the day was Wilson's Promontory, the most southerly point of the Australian mainland. Driving was challenging with gusty conditions in the form of a cross-wind. For the first time we used the windshield washers and wipers and in the process found out what the mysterious green panel light is for. I had scoured the internet and asked all sorts of people who claimed to have driven a Coaster and without success. In fact, the light indicates that the exhaust brakes are engaged and is activated by the washer stalk from the steering column. When the accelerator pedal is pressed, the brake automatically disengages, which is why it took so long to work out. 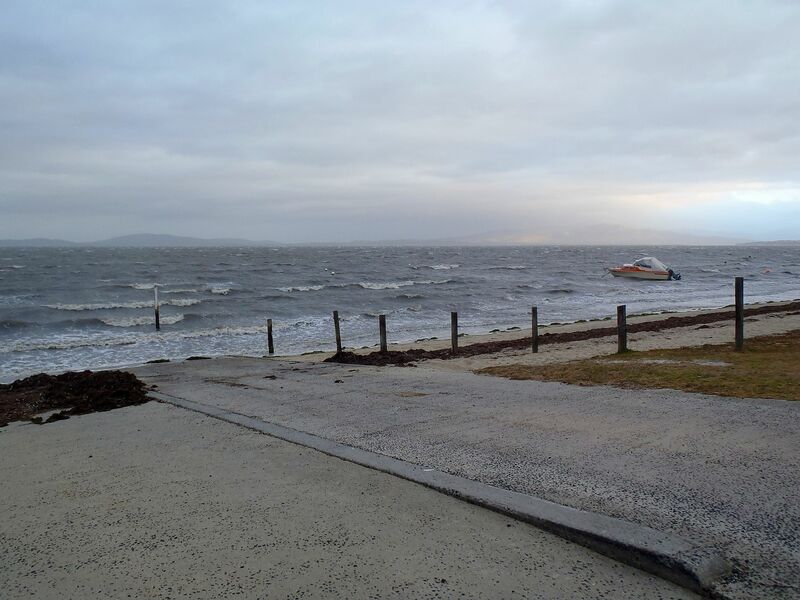 We stopped for the night just outside the Wilson's Promontory National Park at Yanakie Caravan Park. Again we parked just next to the beach on Corner Inlet. 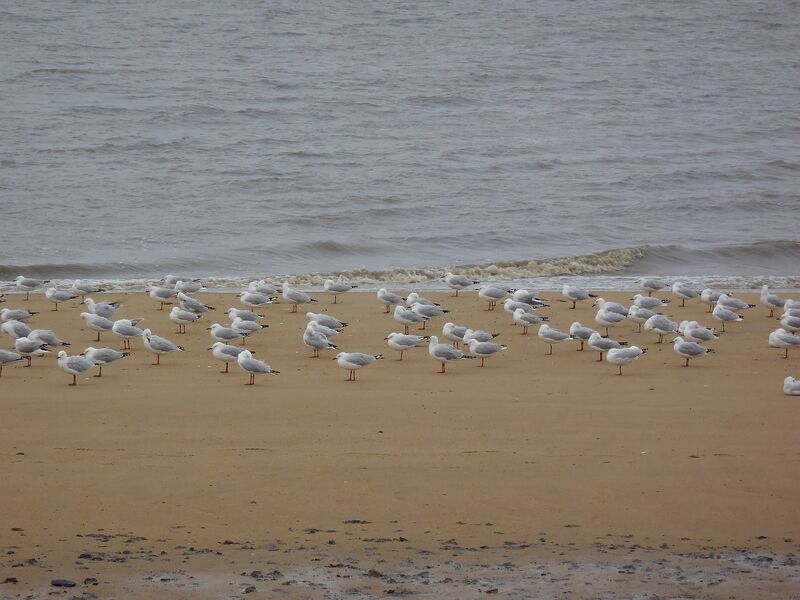 The wind was blowing directly onshore at 30 knots plus and seagulls huddled together in collective misery along the sand, just out of reach of the waves. I looked up the marine forecast which warned of five meter waves offshore. We filled our fresh water tank to the brim and for the first time ever, we have used the onboard propane stove instead of the microwave and for the first time, we used the onboard shower instead of scurrying to the park showers. Eventually we layered ourselves with enough windbreakers and sweaters to brave the elements and walk the beach in a gesture of solidarity with the seagulls. Although it is forecast to be warmer tomorrow, the winds remain fierce. 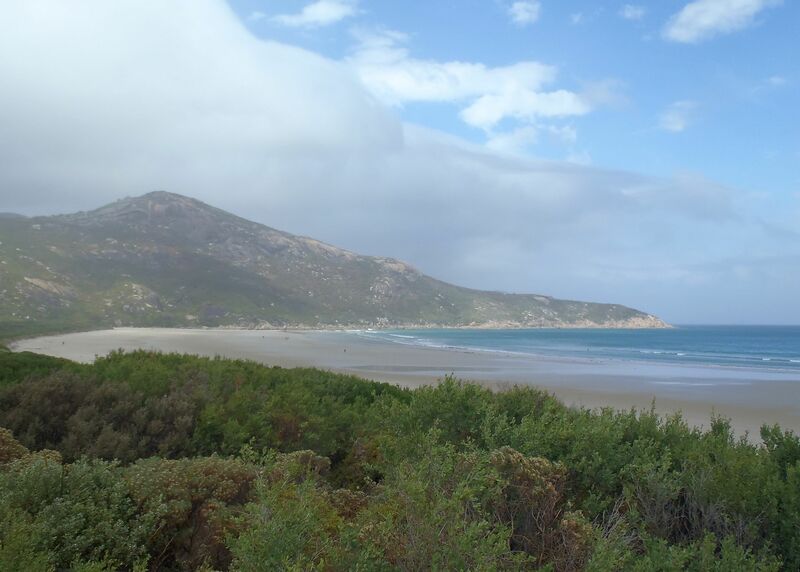 This morning we drove to "Tidal River", site of the park headquarters, on the banks of the Tidal River, some 30 kms. from the park entrance on the west side of the promontory. This is where the blacktop ends and we found a vacant campsite near the beach and parked. 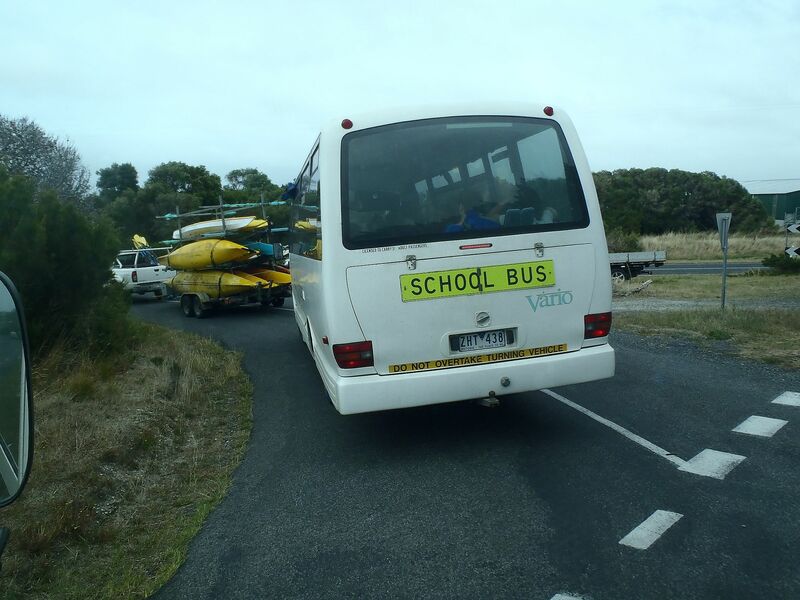 The campground was quite full, with bus loads of school-kids in group camps, adding to the overall population. Most campers used tents and many carried surfboards on their roof-racks and like the school-kids, were here to surf. We first walked to the beach, a broad expanse of creamy sand, trapped between rock outcrops. There were a few swimmers and none surfing as the wind was too strong for boards. The waves looked good but their tops were being blown away in horizontal spume. With the wind blowing hard from the east, we were in the rain shadow of Mt. Oberon and sure enough, light rain blew horizontally for most of the day. 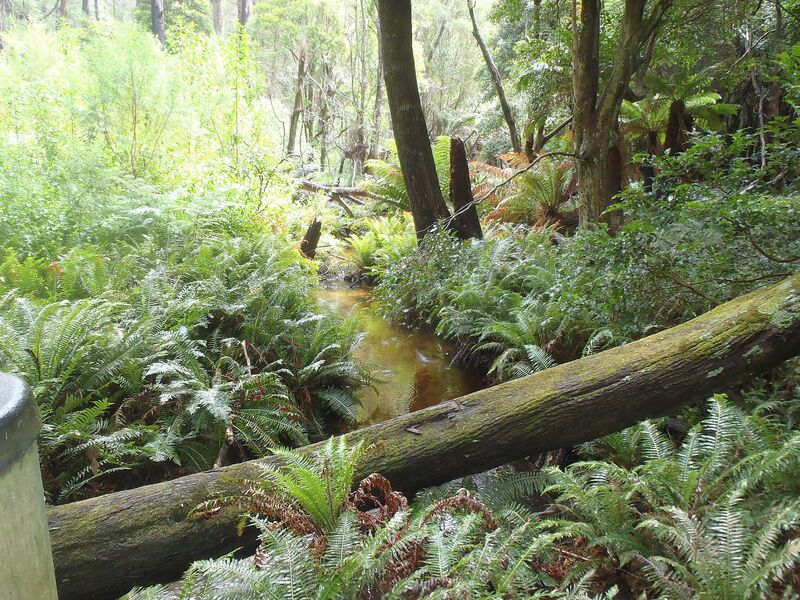 We decided to hike "Lilly Pilly Gully", a sheltered section of temperate rain forest on the north side of the river, about 5 miles round-trip. We soon stripped off rain-jackets, since it was not particularly cold and the rain was evaporating from the windward side of our clothing about as fast as it was collecting. Crossing over the pedestrian bridge over the Tidal River was challenging, as the wind was funneled along the river course. I clutched my hat in my hand during the passage and watched a group of kayakers make zero headway against the blast. The hike was pleasant in the shelter of the trees, with strong but unfamiliar scents of wet vegetation. 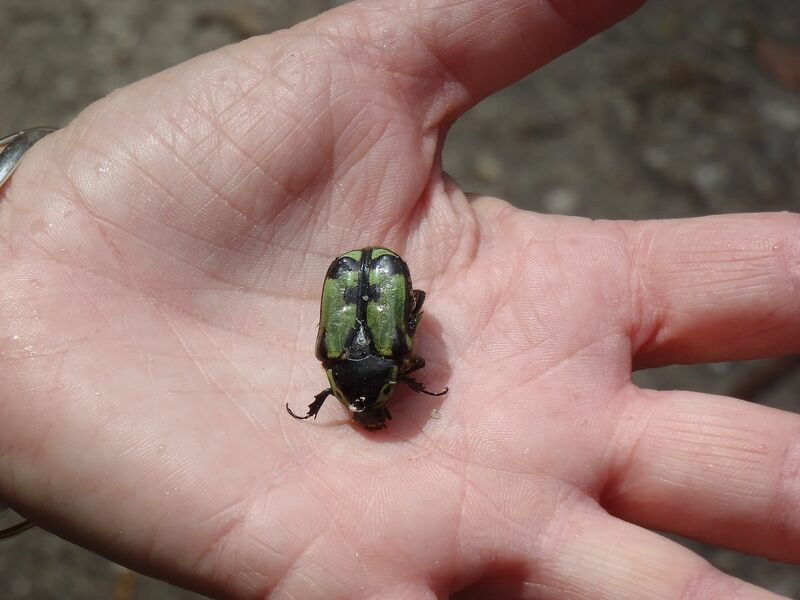 We saw a single magpie that argued back at Annette when she mimicked its call, a dead beetle and quantities of dung later identified as Wombat poo. A pleasant, not overly strenuous hike and the first real exercise we have had since our "hash" on Guam a month ago. Back at the campsite we saw a spectacular Crimson Rosella, begging for food at a campsite and a Laughing Kookaburra at our own campsite, perched on a branch maybe 15 feet from the bus. Apparently, the wildlife here is found where the food is. 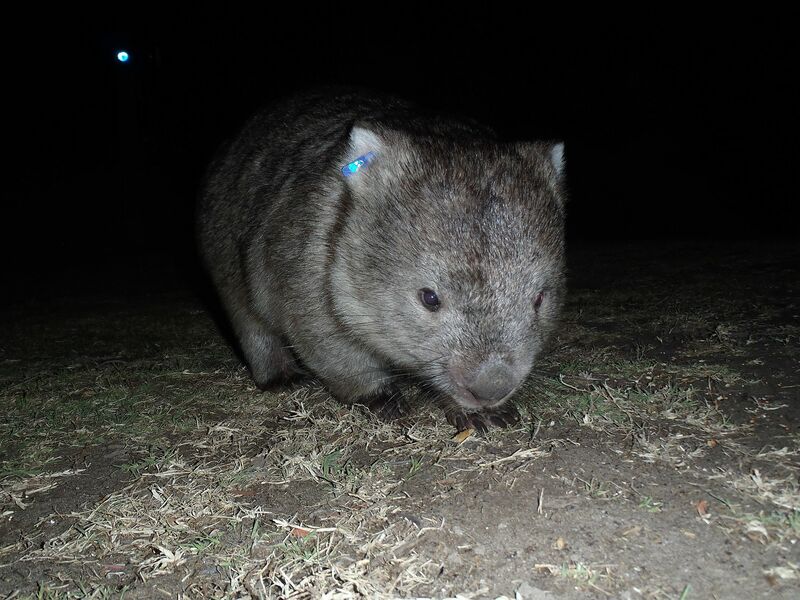 We had been warned not to leave food outside at night as scavenging wombats would likely visit the campsites, so dusk found us sitting in darkness in our bus, eagerly watching for movement. As the camp settled down and pedestrians with flashlights grew fewer in number, I noticed a dark mass where none had been and flicked on my green laser "target designator" we had carried with us from Corpus Christi. 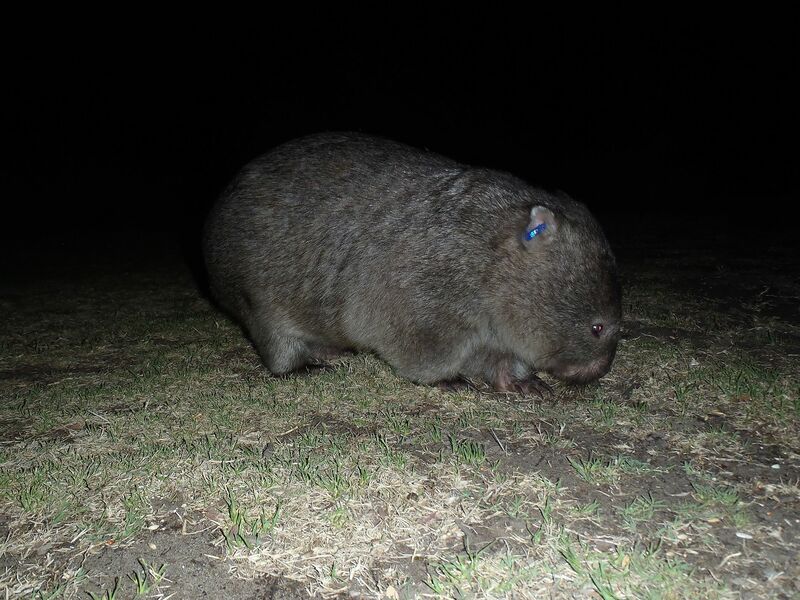 Sitting in the green spotlight at a range of twenty feet and seemingly unperturbed, was a wombat, the first we have seen outside of a zoo, in condition other than road-kill. Annette photographed him / her from all angles and the wombat seemed not only unconcerned by the attention, it approached the camera within inches, presumably thinking it was proffered food. How exciting! 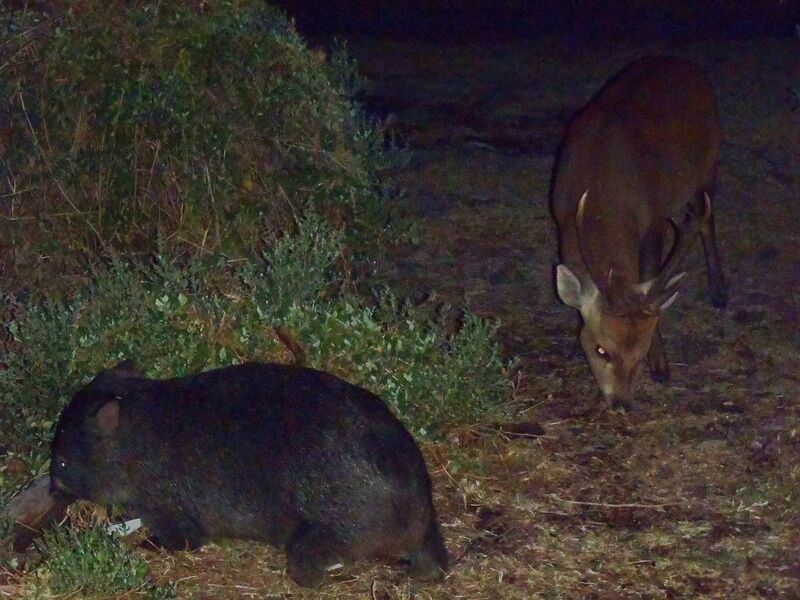 An hour later, the wombat was joined by a grazing deer. The deer was within feet of the bus but much more skittish than the wombat. 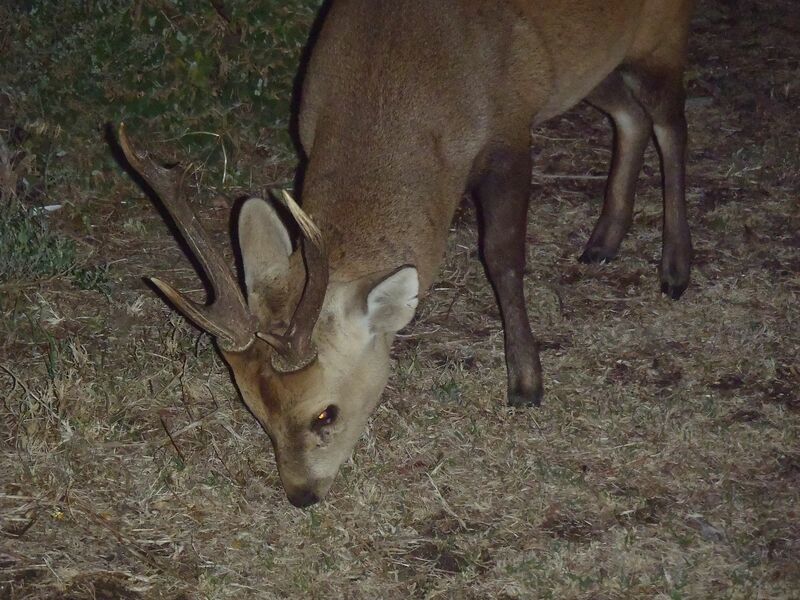 The deer had four prongs on its antlers and was unidentified by our "Wild Australia" guide book, discriminated against for the sin of being non-native. Rabbits and mice visited our campsite but these were yawners, we have seen them before! Last night the red light warning came on in the potty. Whoa! The potty manual was the first one we had read and and as you might intuitively guess, means the tank was full and one of the major conveniences of RV ownership has just disappeared - until we empty the tank that is. 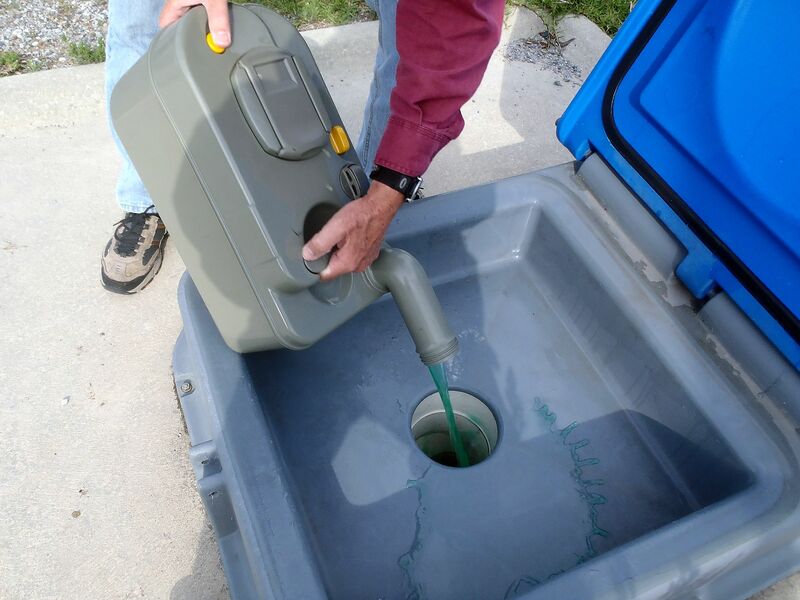 The claimed holding capacity is 17 liters or 4.4 US gallons – less than a typical fuel jerry jug but then you do have to carry the “cassette” to the dump station. (The built in “black water” tank on the US version of motorhome holds 50 gallons, more than ten times this capacity but would weigh in at over 400 pounds when filled). We have just learned that our cassette toilet must be emptied every second day. The wind was still blowing like crazy on the Promontory and we received an e-mail from the crew of S/V Sortilege, warning of a major storm system up north and possibly heading our direction. 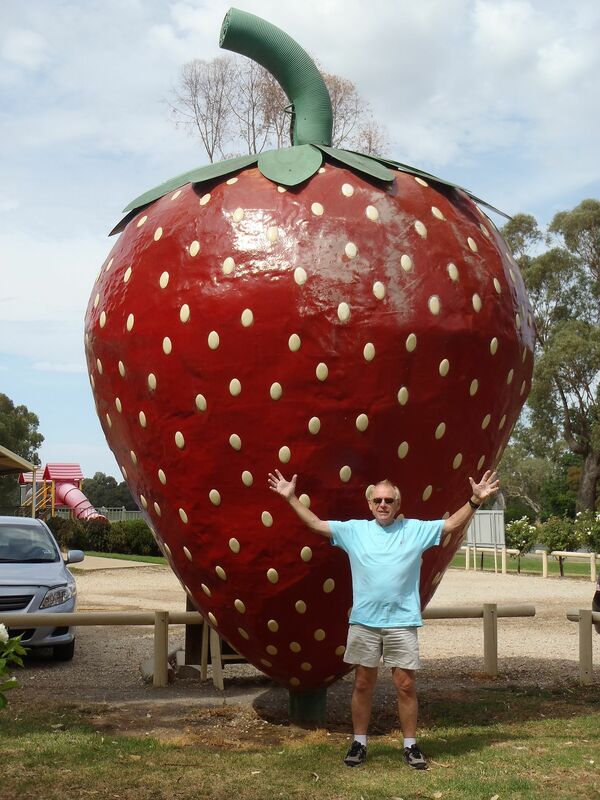 We decided to move on to more sheltered climes and drove northeast to Bairnsdale, a small town of about 11,000 population, straddling the Mitchell River behind barrier islands on the south coast. The caravan park we stayed at was near downtown and adjoined the river-walk. We had experienced sharp crosswinds during the drive here and with the prospect of more of the same, decided to stay for a couple of nights. We enjoyed a reasonable but expensive meal at a downtown hotel (read “pub”) and retraced our steps along the river-walk towards the RV. By now it was dusk and the air above us was thick with fluttering sulfur crested cockatoos. 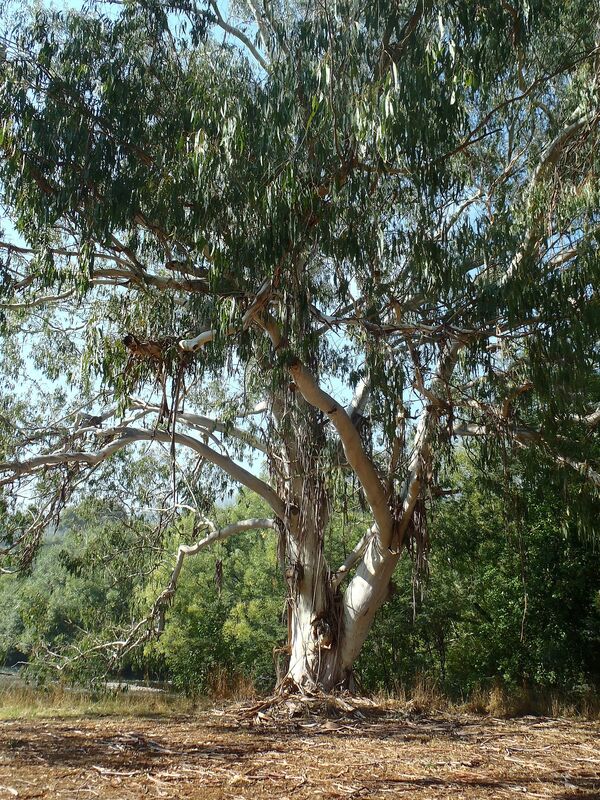 The tall gum trees on the river banks were thick with roosting birds and their raucous chattering was deafening. We stood entranced for perhaps a half-hour before continuing our perambulation. 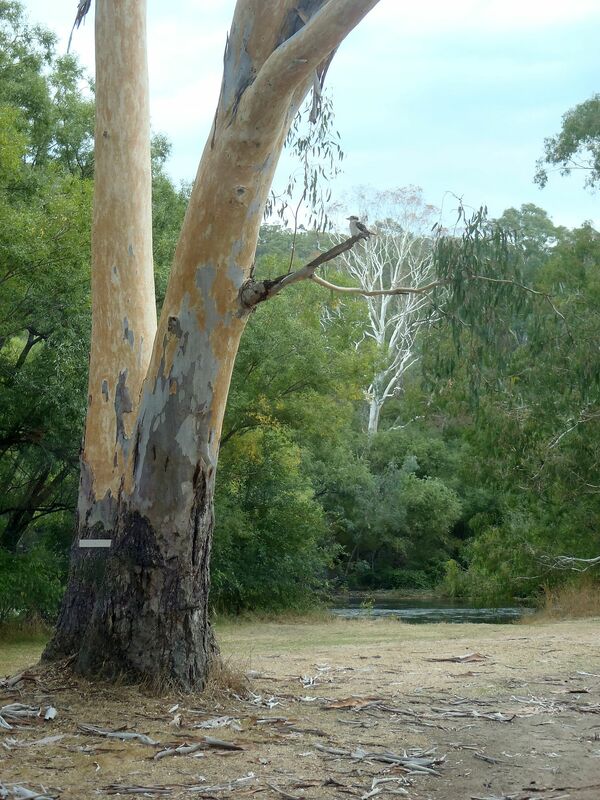 At one point there was a lone, tall gum tree on the opposite bank, gleaming almost silvery in the three quarter moon and one half of the tree’s branches were filled with birds having the distinctive snake like head of cormorants, whilst the other half was rapidly filling with still circling cockatoos. 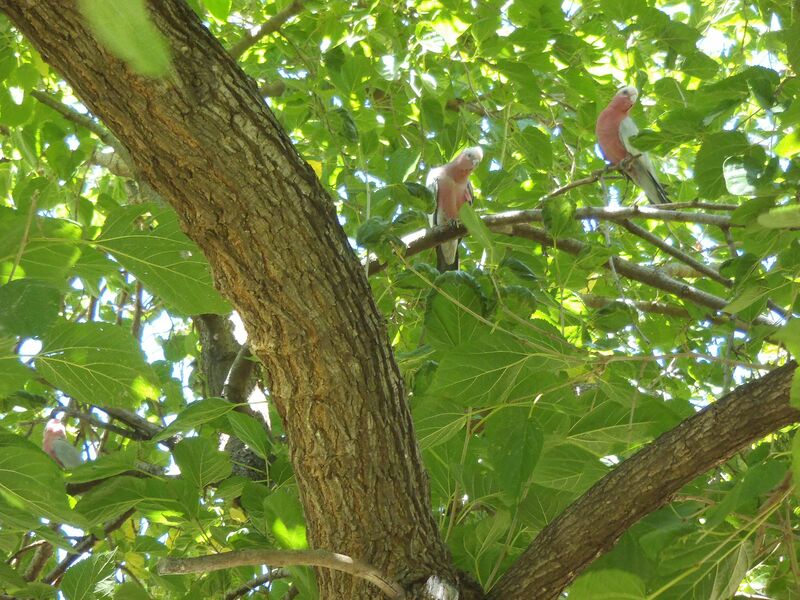 Occasionally a cockatoo would land in the wrong half of the tree and a great hubbub would ensue until everyone was mutually settled. A memorable evening. Today was a shopping chores day and I needed a rear cargo mat, some anti-freeze and a pump to get the anti-freeze into the radiator reservoir. I had located this yesterday and found it disconcertingly dry. I also raised the air pressure in the front tires to the recommended pressures I had discovered on the internet and hoped that this would improve the cross-wind handling of the bus. The vehicle has not burned oil – a good sign but the odometer stopped at Wilson’s Promontory at 189,999 kms. both irritating and inconvenient. I also measured the exterior of my fresh water and “grey water” holding tanks and calculated the volume at 100 liters and 46 liters respectively. Meanwhile Annette had been grocery shopping and after a lifetime of living with the convenience of automobile shopping had discovered that she had purchased too much stuff to conveniently carry. 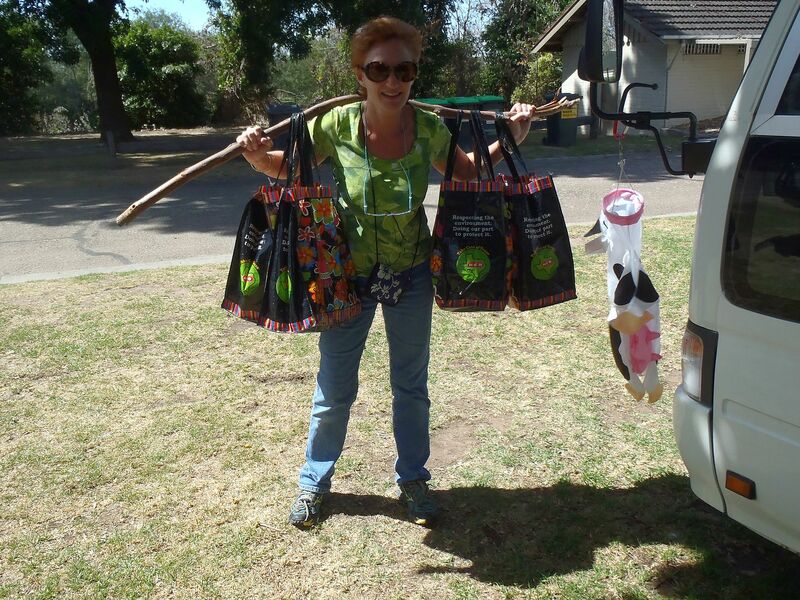 She “solved” the problem using a large eucalyptus tree limb she found in the park and after distributing four large shopping bags along its length, carried the pole across her shoulders in “coolie” fashion. 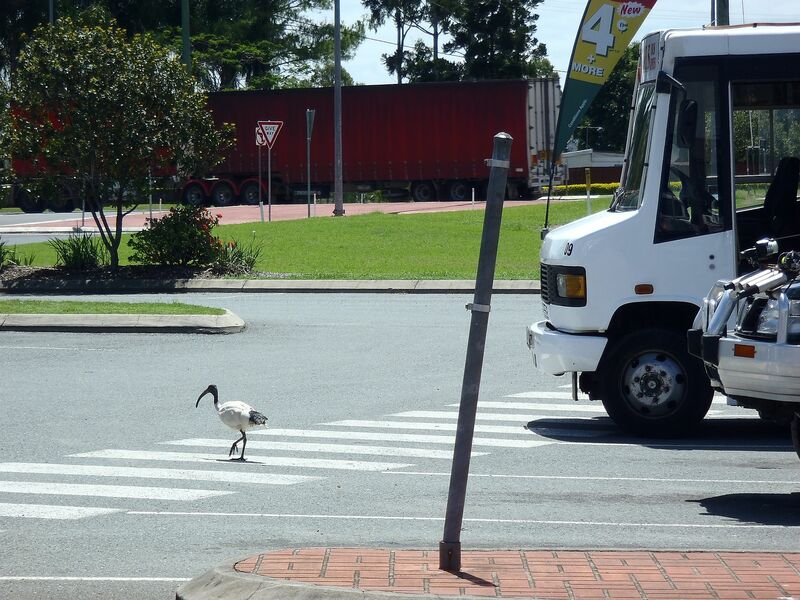 The residents of Bairnsdale will not soon forget this sight. I have a picture. Poor Annette. She woke up with aching and sore shoulders and promises never to carry groceries ever again. The weather forecasts show a storm, slowly moving south along the coast, thus we decided to head northwest and inland, to avoid the worst of the weather. The previous evening I had checked the Victoria road conditions and confirmed that there were no problems on our proposed route. Our intermediate destination for the day was the town of Wangaratta and by mid-morning, we arrived in the village of Omeo. Here we topped up with diesel and continued to the outskirts of town, where we were met with a lighted sign that warned, “No access beyond Mount Hotham”. What the hell did this mean? Our map showed no such place. Was this off the main drag? Does this mean no credit cards accepted? We returned to the gas station in the village and were told, “Yes, the road is closed”. There had been a forest fire and there were allegedly fallen trees across the road. 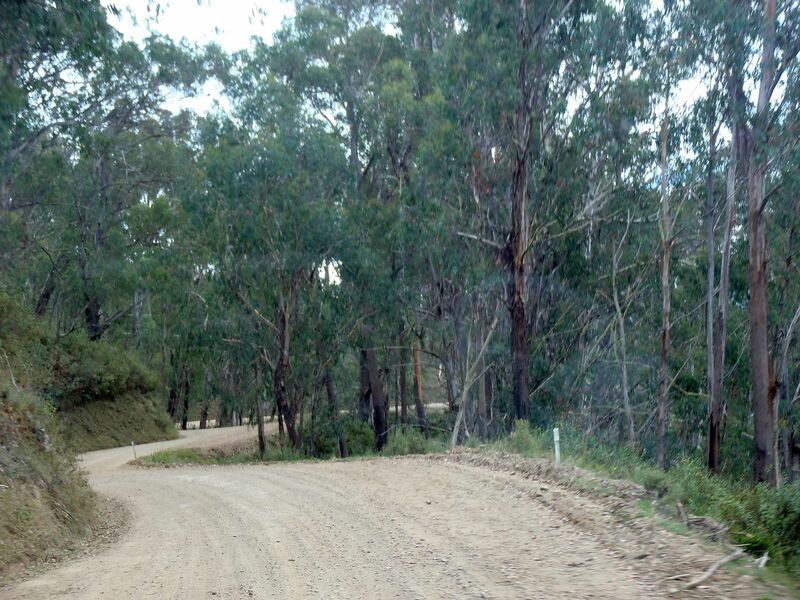 We were directed instead to the highway to Tallangatta, although this road was completely missing from our map. Nevertheless, the compass showed north and we were heading the direction we might want to go. The road was climbing steeply, hugging a rough, rock cliff-side with awesome scenery to the east, coupled with sheer drop offs to a wild river below. The forests were tall eucalyptus and we passed no road-kill. This was not particularly surprising, since we passed few other vehicles on the lower stretch of the highway and none after we left pavement. The road which began as two lane blacktop, with a dividing stripe, had deteriorated to unmarked blacktop; then double lane gravel, then single lane gravel and finally, we drove on single lane dirt for over an hour. The Tom-Tom GPS insisted that we were indeed on a highway and I blessed the fact that we had a full diesel tank, as we ground upwards and then downwards, constantly changing gears and steering around the endless bends. 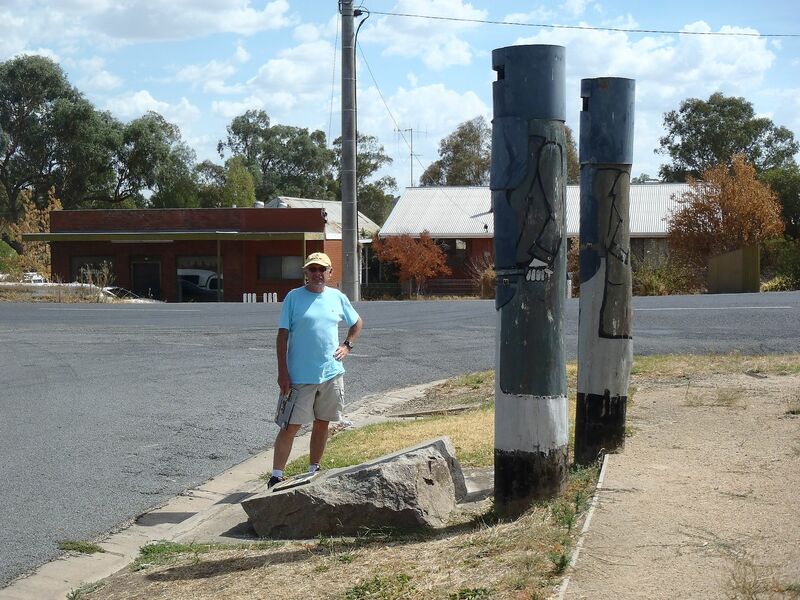 When we stopped for the night at Mitta Mitta – population 35, we had been driving for 6 hours to cover 240 kms. – an average speed of around 25 mph. 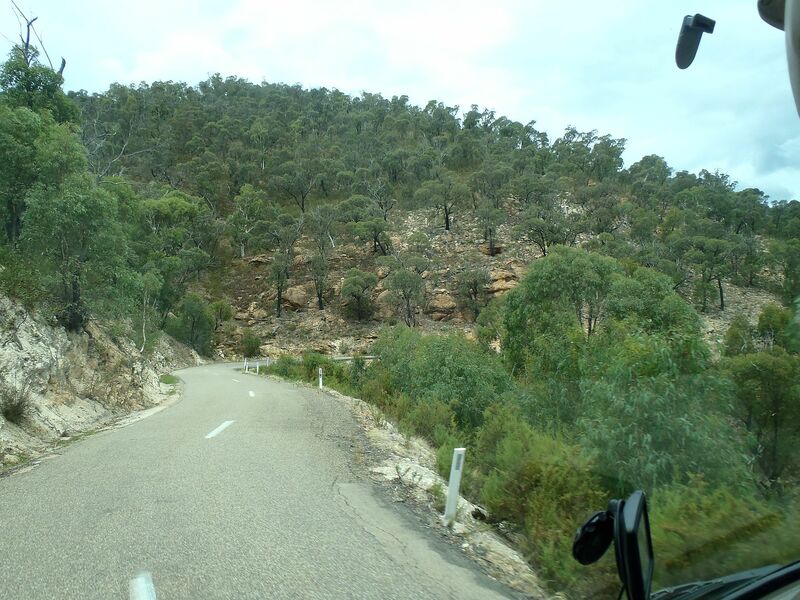 Our route lay on the west side of “Snowy River Country” and the creek we had followed was “Snowy Creek”. We pulled into the campsite on the Mitta Mitta river and met retired postal worker Kevin, plus local horse rancher Trevor. Trevor was straight out of the movie, “The Man from Snowy River” and looked as though he had been chasing brumbies for months, while sleeping on his horse. He was hard to understand, even if he had teeth, which he didn’t and hadn’t consumed a considerable quantity of Bundy Rum and Coke, which he had. He talked of musters in the high country and conditions so bad that, “Even Clancy would take a pull”. OK, Clancy is the master horseman from the Snowy River movie but “take a pull”? I queried several Australian speakers without success and finally found a reference dating to 1890 and verified by several sources. It means to check oneself, i.e. to pull oneself together. 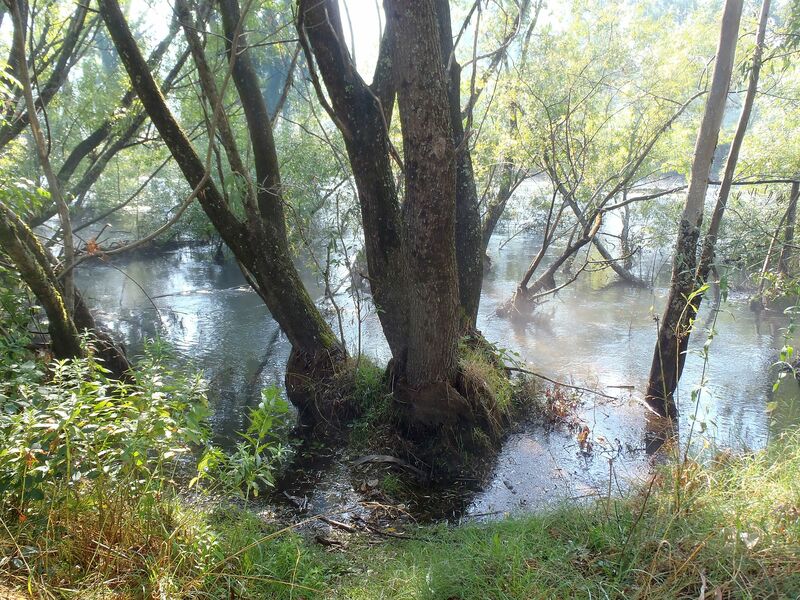 Annette and I walked along the very swift and cold river. Not the place to go swimming. A large Kookaburra watched us from a tree limb. Annette had been told that they will eat proffered hot dogs, so she has already purchased same and moved them from freezer to fridge in order that they are Kookaburra ready. The town (?) 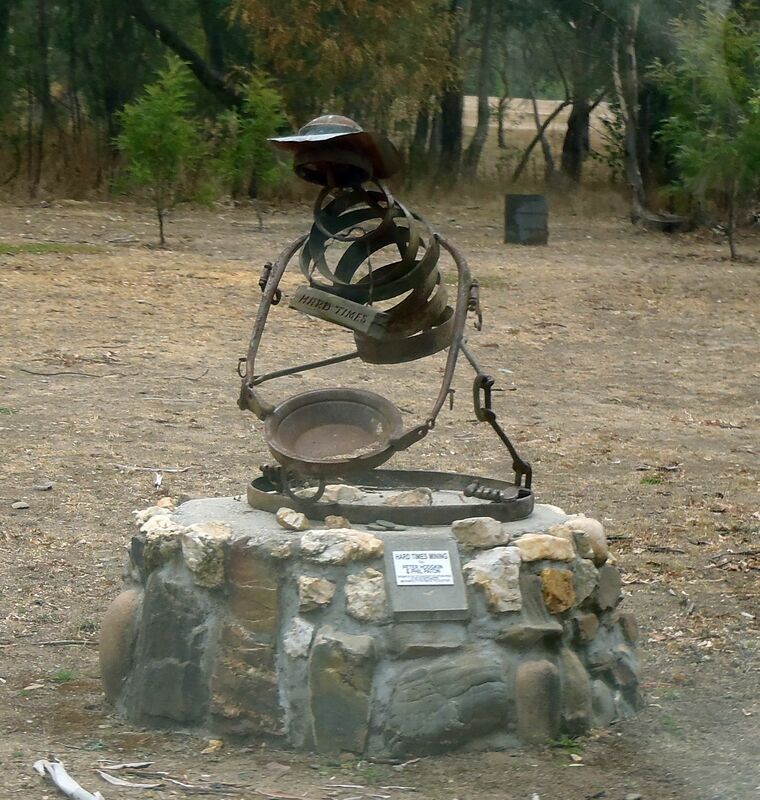 of Mitta Mitta boasts a golf course and is the site of the famous Mighty Mitta Muster http://www.mitta.com.au/mittamuster.html when the population of 35 is boosted by several thousand visitors. I don’t know where they can all stay but nevertheless, we have booked a powered site for this week-end. 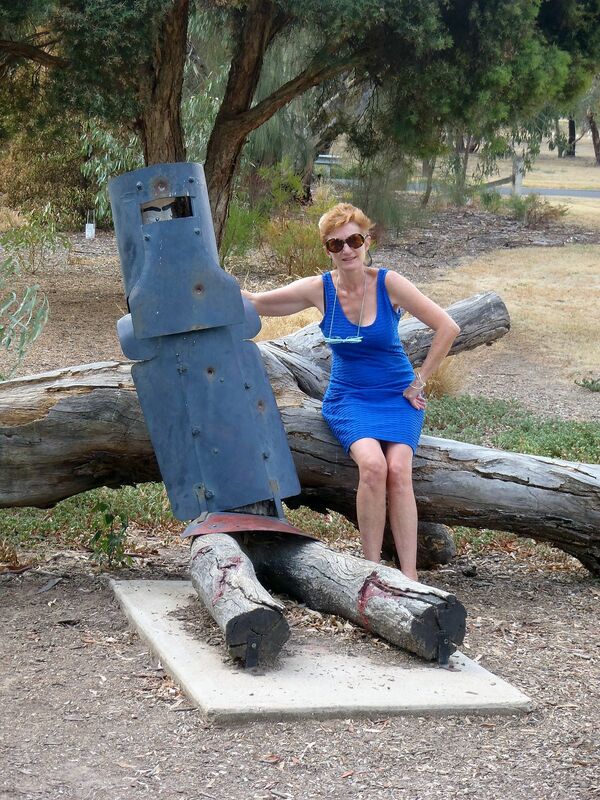 We had decided to explore the legend of Ned Kelly and drove to the small town of Glenrowan, the place where Ned had his final shoot-out and where he was defeated and arrested. 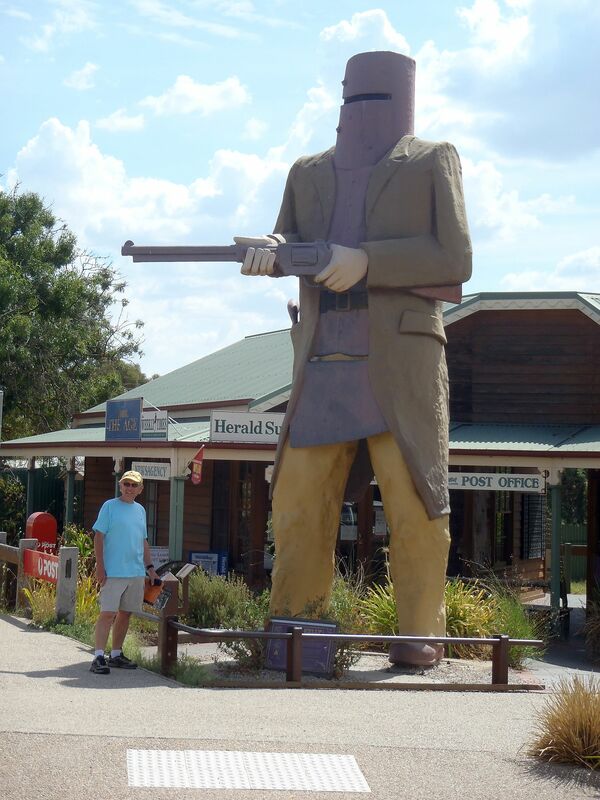 Ned Kelly is a larger than life figure in Australian history and regarded as a sort of Robin Hood in popular legend. The truth is stranger. Some sources have simply defined Ned as a ruthless criminal, who stole from anyone and everyone and never gave away his ill gotten gains, unless to members of his own family. The short version is that the Kelly’s had a series of run ins with the law and Ned had a juvenile history of escalating incidents. A single policeman came to the family house and got into a scuffle with Ned’s mother and brother. The policeman claimed he was hit over the head and shot in the arm. The same policeman was later dismissed from the force for perjury and drunkenness and the doctor who examined him, stated that the man had never been shot – nevertheless, Ned’s mother was sentenced to three years imprisonment and the police were also looking to arrest Ned. The latter took to the bush with friends. Four policemen hunted them in the bush without success. One day the Kelly’s detected the presence of the other group and decided to attack their camp and disarm them. The plan went awry, three of the policemen were shot dead and Ned became famous. Less than two years later, Ned supposedly provoked a confrontation with the State by shooting a former gang-member turned stool-pigeon and setting an ambush for the contingent of police expected to arrive. The ambush failed and during the nine hour gun battle that followed, Ned was wounded and captured and two of his companions were killed. 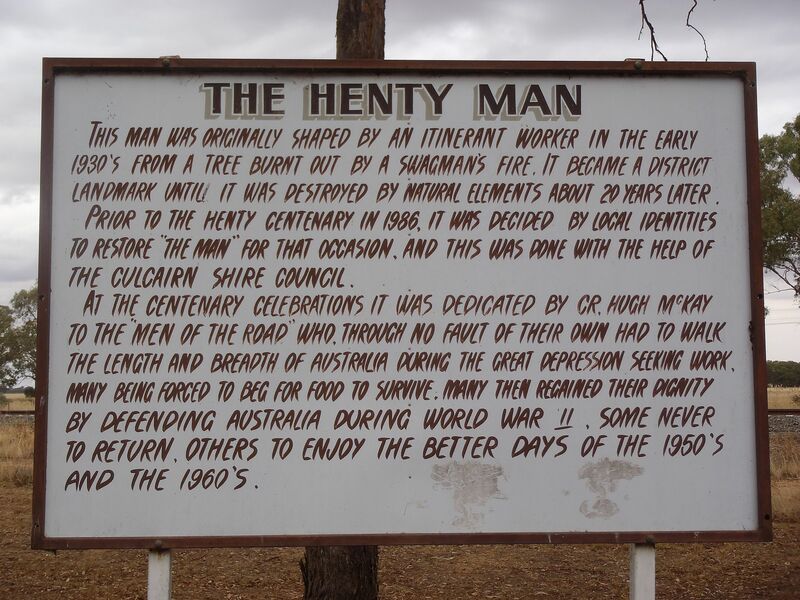 We read the historical markers at the site of his final shoot-out and capture and had been given a flyer at the local post office describing his background and the events in Glenrowan. Finally we had been given a folder with historical information at the campground in Glenrowan where we spent the night. All three versions of the events had discrepancies, plus anomalous facts that hinted at a political involvement. First, the owner of the tavern, where Ned had holed up with hostages, had been cleared of complicity with Ned but not permitted to rebuild on the original site and further denied a liquor license. 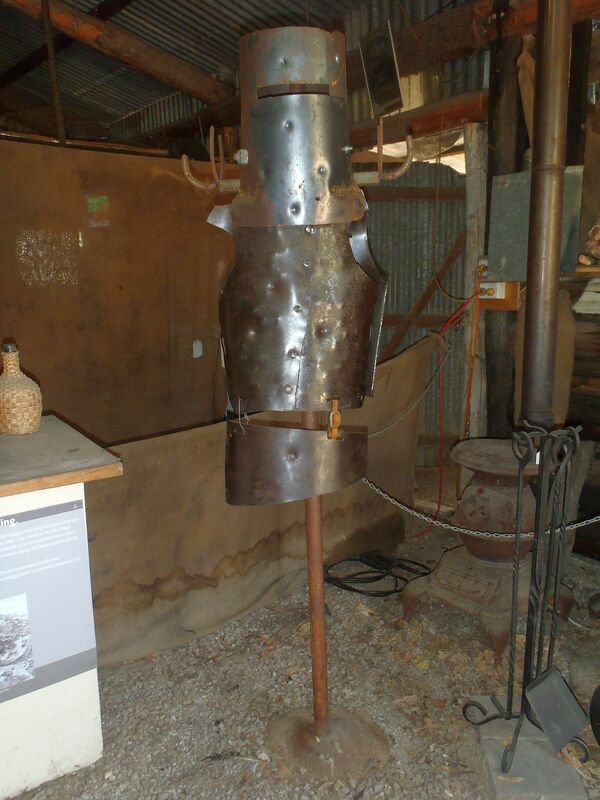 Second, when the police had felt they were outnumbered by Ned Kelly supporters and to diffuse the situation, they agreed to turn over the bodies of two of Ned’s gang to relatives. If Ned were just a common criminal, why did he have so many “supporters”? There were mentions of Ned wanting to be the focus of a popular uprising, with a “declaration of independence” for this region of Victoria but these mentions do not jibe with the concept of a near illiterate, common criminal. I knew that Ned had killed three policemen and had clad himself and his gang in homemade armor (weighing 95 pounds!!) - that alone was unusual. The man who thought to shoot Ned in his unprotected legs was Sergeant Steele. My Google search also turned up the fact that Ned dictated several letters, including a 40 page letter proclaiming his innocence and had demanded its publication in local newspapers. The basis of complaint was that the police were corrupt and sided with the bigger landowners who were of predominantly English and Irish Protestant stock. The poorer folks, such as the Kelly’s, were of Irish Catholic stock. in fact Ned’s father had been deported from Tipperary for stealing two pigs. Ned’s letter was suppressed and not released for publication until the 1930’s, fifty years after his death. The local blacksmith also made a statement which caught my attention, to the effect that the news of Ned’s arrest was known in London, the same afternoon of his capture in 1880. How was this possible? I checked and discovered that Victoria had the telegraph in 1853 and by 1872 the connection to Darwin was made. In the same year Darwin had been connected to Java by submarine cable, thereby connecting Australia with the world. Rain in today’s forecast. The weather radar shows heavy precipitation to the south, so we decide to head north. We drove along quiet and empty roads, passing between vast, empty fields, stretching seemingly for miles. Autumn is here and the hay has been harvested. We passed from the State of Victoria back into New South Wales as we drove. Around noon we were surrounded by rain cells and sure enough the rain began to fall in earnest. We stopped for the night at the pretty little town of West Wyalong, established as a gold mining town around 1893 and now with a population of around 800. We had been at the caravan park perhaps fifteen minutes, when I noticed water gushing from below our bus. I turned off the hose water supply at the faucet and tried to pump water from the internal tank using the electric supply pump. I could hear the pump running but no water to the sink. I assumed this meant we had a break in a water line beneath the bus, between the pump and the sink. It is raining and the ground is muddy. We decided to use water from a bucket for the night and will attempt to sort this problem out tomorrow morning. It rained all night and the dust on the bus has turned to streaky mud. At least the dust made us look adventurous and rugged, now it just looks dirty. 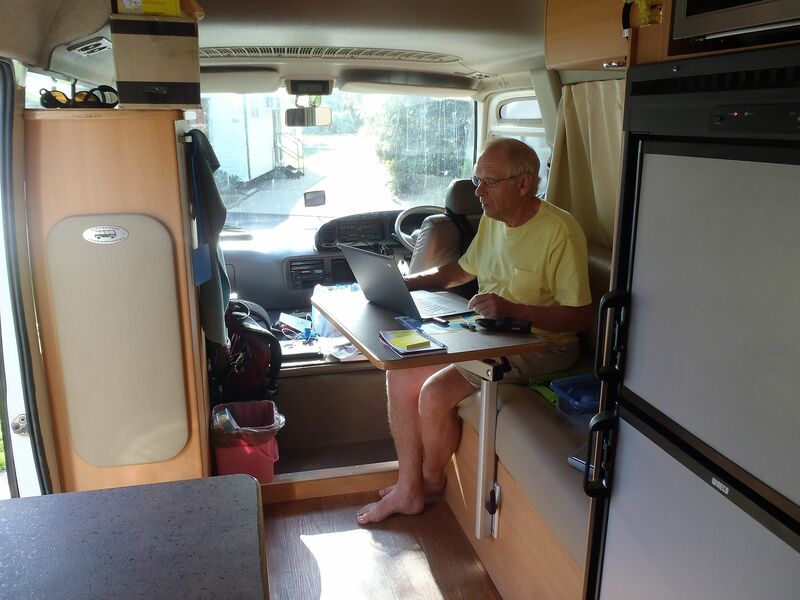 We had decided to spend another day here in an attempt to make repairs and as I was not looking forwards to lying underneath the bus in the rain, I began the day by preparing the information needed for my 2012 tax return. By the time I had exhausted this and all other tasks, the rain was reduced to a drizzle and I grabbed some plastic sheeting to lie upon and slid under the bus. There was just room to do this and I found the water pump buried deep between the various holding tanks and immediately found the cause of the leak. I had dreaded asking Annette to turn the water back on at the hose and was delighted that this was unnecessary. There was a plastic “one way” valve plumbed into the supply line and this had broken in half. The next question was, could I find a replacement in a town of 800 souls? I called the plumbing supply in town and soon determined that a replacement for the original was not going to happen but nevertheless decided to walk over and and see what else might be used. The plumber did have a brass one-way valve that was much sturdier than the plastic original but was also longer. I bought some fittings but the plumber did not carry a replacement for the type of hose I had to cut in order to remove the broken part. I installed the new parts and we again have a water supply in the motorhome but I am eventually going to have to replace the flimsy plastic tubing used with something sturdier. It continued to rain for most of the day and we borrowed DVD’s from the park office and settled in for the afternoon with popcorn and beer. Still raining but we decided to drive north to Dubbo, a larger town of around 40,000 population and where we are more likely to find plumbing parts. I haven’t bothered to upgrade my temporary plumbing fix yet but I did buy the parts. Annette went grocery shopping and this time got to wheel her purchases up to the bus in a grocery cart. No more coolie poles.